The primary focus of this article is to illustrate how urbanization in the developed English speaking world (DESW) began largely at the onset of the nineteenth century during the industrial revolution, culminating in population in the middle of the twentieth century, and subsequently declining in population as suburbanization and deindustrialization took hold. Through the aggregation of population data and the studying of urbanization you gain insight into where humans likely have built buildings during a particular period. One of my main interests lies in exploring Georgian (1714-1837 [to 1860 for this article]) and Victorian era (1837 [from 1860 for this article]-1901) architecture which one can with noticeable accuracy predict in what general area examples likely at least once stood. The median year between 1790 and 2010 is 1900 and the most populated municipality in the world and subsequently the DESW was London, England which had 4,536,541 inhabitants (metropolitan county/inner city population) in 1901. This number is used as the maximum y-value on the charts used in this article, hence acting as a reference point. With the year 1900 being the median, the forty-one municipalities I chose to analyze in this article are the top forty most populated ones in the developed English speaking world in the year 1900, plus one extra for comparison. The population is analyzed in ten year intervals since the censuses were decennial. 1790 was the date of the first American census in the newly formed republic. Finding reliable data for American or British controlled areas earlier than this date is extremely difficult. This series of articles constitute a work that is constantly in progress and from time to time you may notice revisions. Through all of this, I strive to make all of my work coherent in style and flow to ensure easier understanding. For every image or map in this article there will be a link to the original full resolution source located in the description located below them. You can use this for closer examination. In trying to keep everything simplified, I use one universal referencing list for all of the articles in this series which you can find here. Reference numbers in this article are expressed within [brackets]. All of the data used in this article is for the municipality proper aside from the data for Australia and London where the boundaries of the municipality proper were vastly unrepresentative of the entire population. 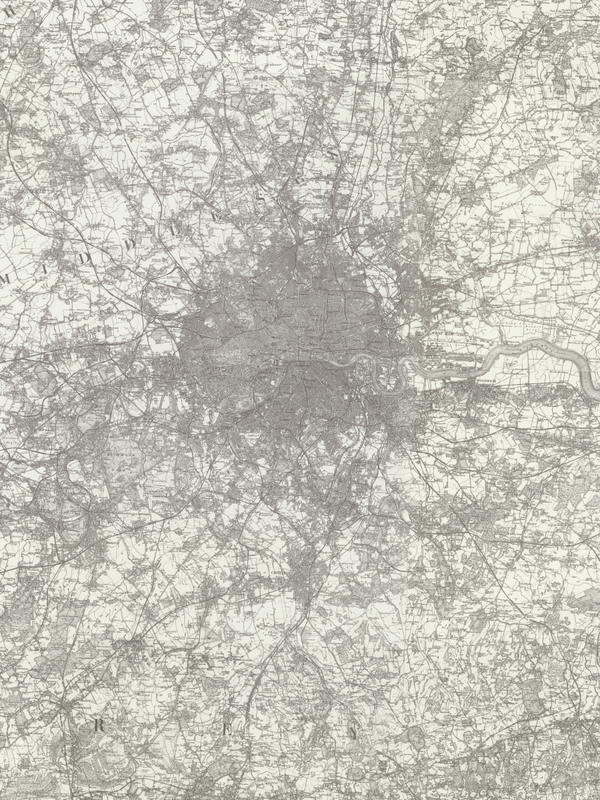 In London for example, the boundaries of the city proper haven't changed since the 1600's. If the city-proper population had been used then London wouldn't have even ranked among the municipalities examined in this article. By the 1971 census, the city of London proper hit its lowest recorded modern population of a mere 4,245 inhabitants. The data used for the American municipalities came from the U.S. Bureau of the Census. (1900). [2.]. It appears to be a complete source of information for the majority of the American municipalities. Since Britain and its dominions did censuses during the second year of each decade opposed to the USA which did them during the first year, the population data for the British Empire is for the 1901 opposed to 1900 for the USA and in many other places. Also, I wasn't able to find data for the year 1790 for the UK so that is omitted. The data for the UK is more difficult to come by so some censuses are missing, especially before 1850. Due to World War Two reliable population data for 1941 is unavailable for the United Kingdom and Ireland. The data collected for the rankings of the municipalities in the UK is most accurate for the 1800's. The year of incorporation as a city for Canada was found via the Canada Year Book 1957-1958 [42.]. When it comes to the urban designation of "city" in the UK it contains more of a ceremonial status than something that denotes population size. The population rank for each municipality in the world in the year 1900 was retrieved from one of my other articles The Population of Every Urban Centre in the World with more than 100,000 Inhabitants in the Year 1900. The municipalities under the population data section are ordered from most populated in the year 1900/1901 to least populated. Included are the forty most populated plus Quebec City as a reference point which adds up to a total of forty-one municipalities. Below is a sample of one of the bar charts featured in this article. The horizontal red line at the top of the chart denotes the maximum y-value which was population of London, England in 1901 (4,536,541 inhabitants). The vertical red line in the middle denotes the median census date which was the year 1900 for the USA and 1901 for places that were part of the British Empire. The bars for the population proper for a municipality are in blue as shown above. If I also plotted the greater area for more realistic comparison purposes, the bars making up that difference will be in red (i.e., London, New York City, Philadelphia, Sydney, and Melbourne). I've found that the population trends of the average postindustrial municipality can be generalized in to three main periods and a minor plateau period as shown below. 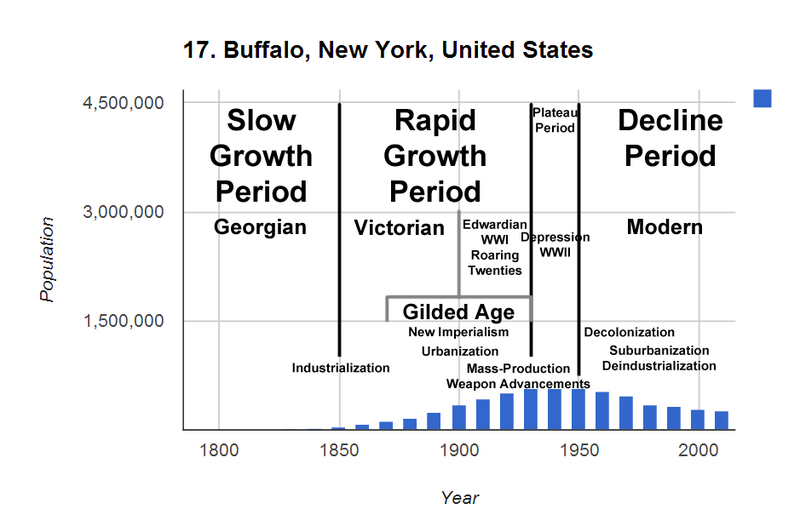 Slow Urban Growth Period (1790-1850), Rapid Urban Growth Period (1850-1930), the brief Plateau Period (1930-1950), and the Decline Period (1950-2010). Included in the sample chart below are other corresponding trends. 1950 tends to be the average year from which the population begins to decline. NOTE: For some reason many tables and charts may not display in this article but they will appear if you refresh the page and maintain a view of the table or chart. The above chart is of course a generalization and one can find numerous exceptions in the population data section of this article. A new trend that has begun to emerge slowly over the past few decades is gentrification where people are moving back into inner-city neighbourhoods and fixing them up. Another phenomenon currently happening is an increase in the amalgamating of surrounding suburbs. This is what tends to cause the most dramatic increases in population between censuses. I also include topographic maps in each municipality's section (still working on finding maps for Australian and Canadian municipalities). They all contain approximately the same field of view meaning that you're able to compare the actual relative size of each municipality. They are all comprised of multiple topographic sheets that have been stitched together. The information on each sheet is not necessarily from the same year but are all from around the year 1900. A date range is displayed in each map's description as is a reference number corresponding to the source of the maps. The original high resolution maps can be found at each source. 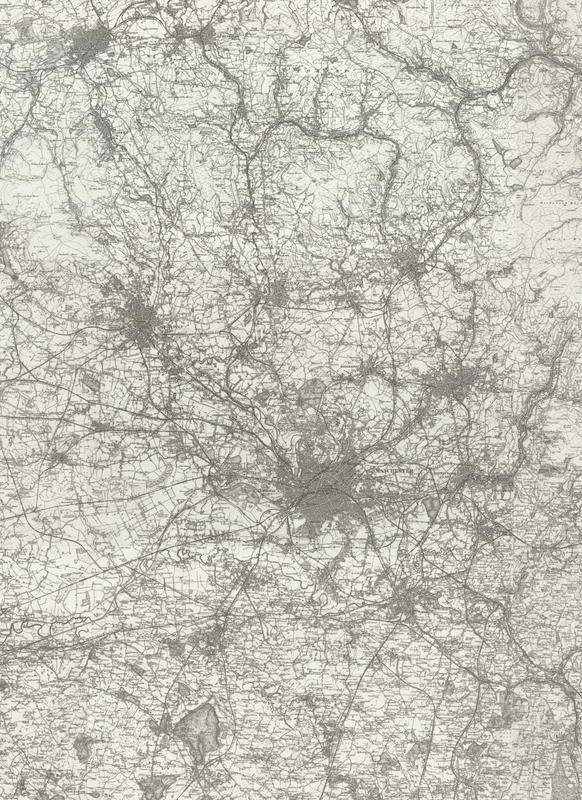 For each municipality in the population data section I include one or two images in an attempt to represent the late nineteenth century urban landscape of the city centre for that municipality. Of course it is impossible to represent every aspect of a large municipality with only one image but there's only so much that can be fit into one article. Not all municipalities still contain as many examples of pre-1900 architecture as they once likely had due to suburbanization, urban decay, and redevelopment. In this article I don't focus much on how many examples still exist as much as I'm just attempting to illustrate that they did indeed exist and there are at least traces of them available. Referring to historic photographs would better illustrate the Victorian architecture that at least may once have been present in some places. 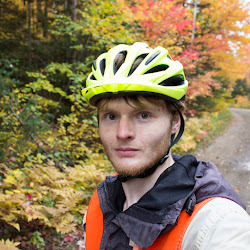 All of these images are screenshots taken from modern day Google Street View imagery. For each screenshot in this entire article there is a link back to that exact view in Google Street View to allow anyone to explore that area. Just a note, I'm always trying to update the data and quality my articles so from time to time there will likely be some changes made. Latest update: none since publishing. Notes and Observations: First, London is exceptional in that it was already home to 879,491 inhabitants in 1801 making it the most populated of all of the municipalities analyzed in this article during that year. Dublin came second with 165,000 inhabitants. London's peak in population is also interesting occurring in 1911 with 4,997,741 inhabitants. It largely plateaus around this point before showing a decrease around the outbreak of World War II which is closer to the average of 1950 where other centres begin to experience decreases in urban population. A map of London, England and vicinity including the county borough of West Ham (included in this article) which is located to the upper right of Inner London (River Lea forms a visual distinction between the two. 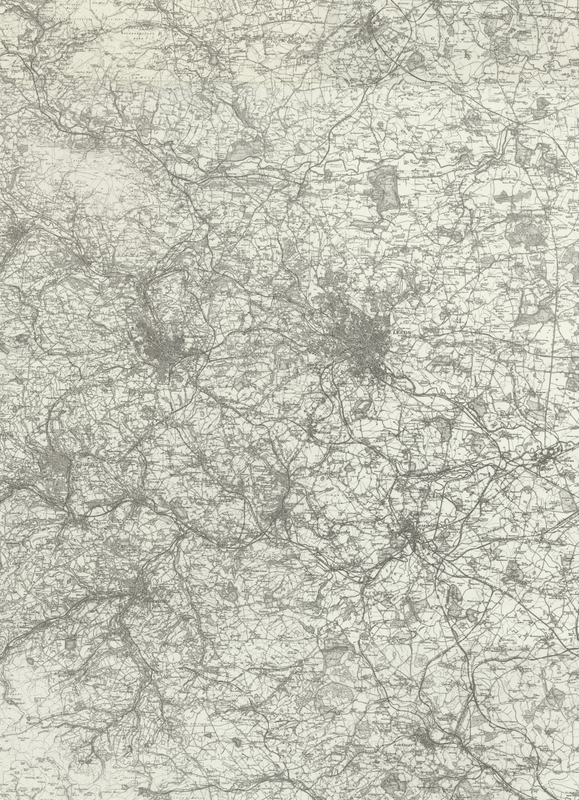 Sheets from an early ordnance survey of Britain, 1885-1900 . 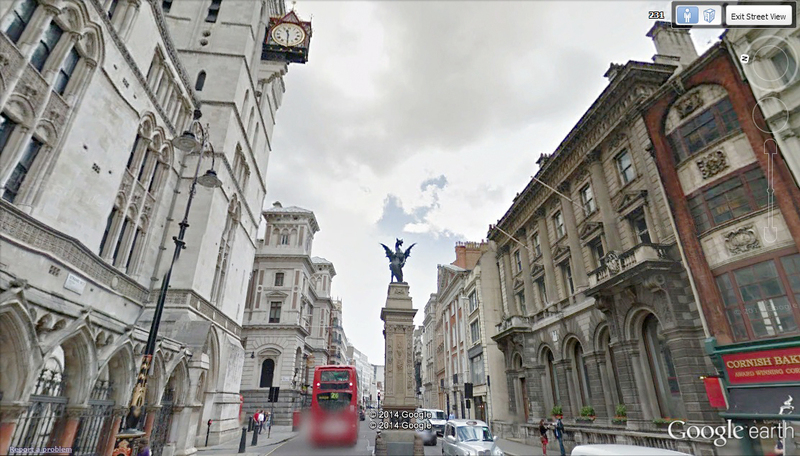 Temple Bar, the dividing point between the City of London proper and the City of Westminster. To the left are the Royal Courts of Justice, built in the 1870's and opened by Queen Victoria in 1882. Further down Fleet Street on the left is the Old Bank of England which was built in the late nineteenth century and is now a pub. The item in the middle of the street is the current Temple Bar marker which was unveiled in 1880. Explore on Google Street View. Late Victorian structures along Mount Street, Mayfair, London, England. Also, London is a place for car spotting. 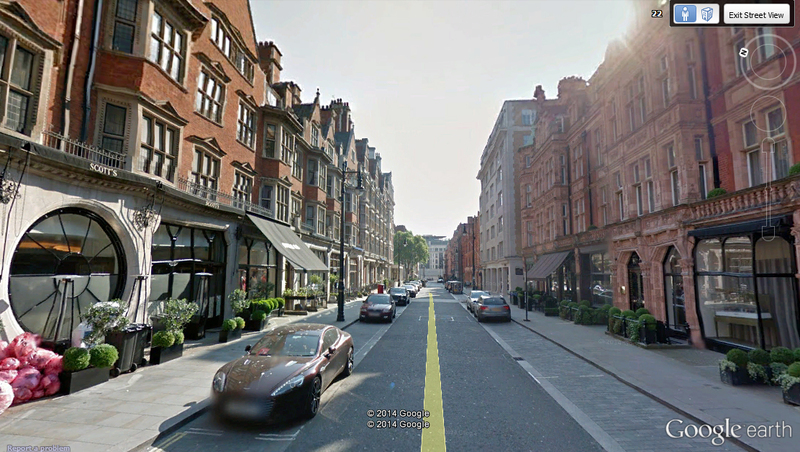 On the left side of the street is an Aston Martin (1st), Bentley Mulsanne (3rd), and a Bentley Continental GT (4th). 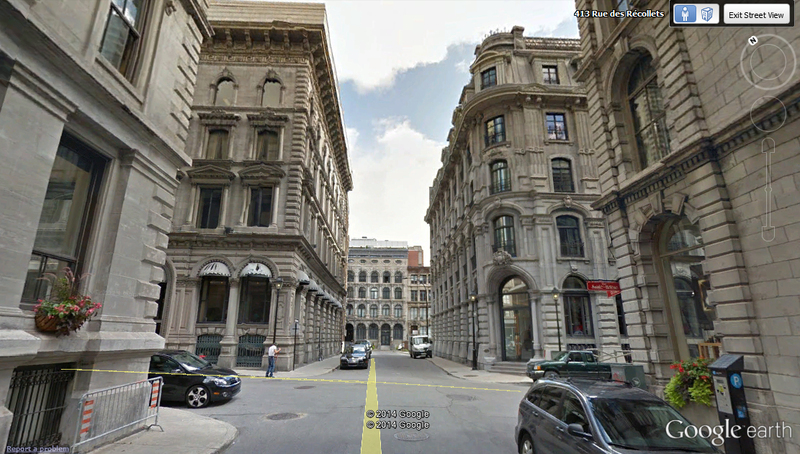 Explore on Google Street View. Notes and Observations: Immediately, likely the most remarkable part of the bar chart is how aggressively New York City meets and subsequently greatly exceeds London's 1901 population. New York City's greatest increase occurred during the 1890's during which it annexed the city of Brooklyn, which at the time was the fourth most populated municipality in the USA (1900 population: 1,166,820). During the eighteenth century Philadelphia had been the most populated municipality of the Thirteen Colonies and subsequently the early United States but by the first official census in 1790 New York City had overtaken Philadelphia as the most populated by city proper. Although New York City had taken this formal title it couldn't technically claim to be the most populated municipality in the United States until the 1810 census when it finally surpassed that of Philadelphia. In the chart below the borough population before the 1898 consolidation is shown in red. 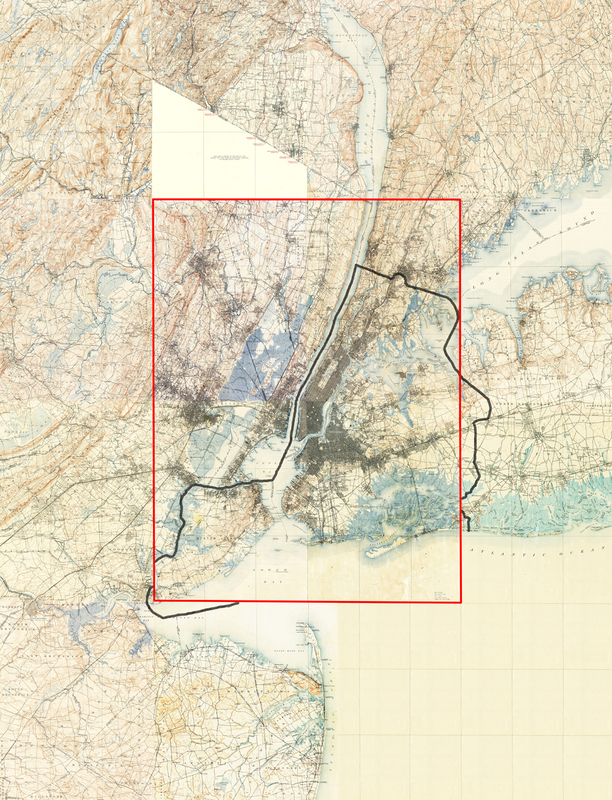 A topographic map of New York City and vicinity stitched together from sheets dating mainly from 1884-1909 . The top sheet with information for New Jersey missing is from 1931 . 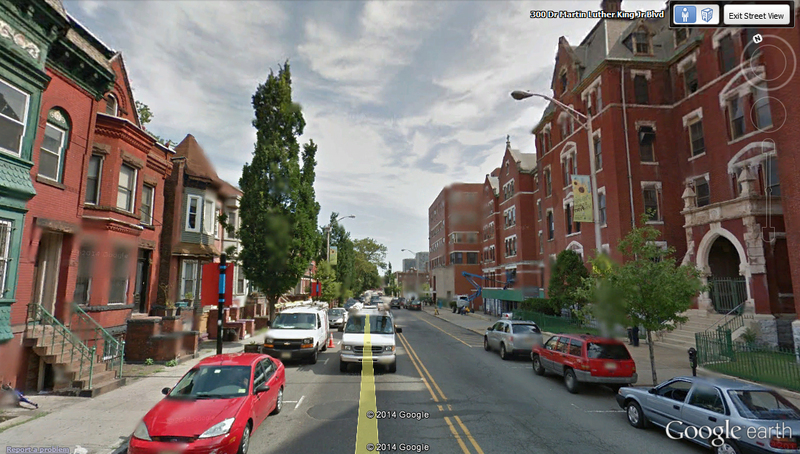 To get a better sense of the area surrounding New York City, a larger than normal field of view is displayed here. To keep things in line for comparison purposes, the section highlighted by the red box correlates with the standard field of view used for the other municipalities. 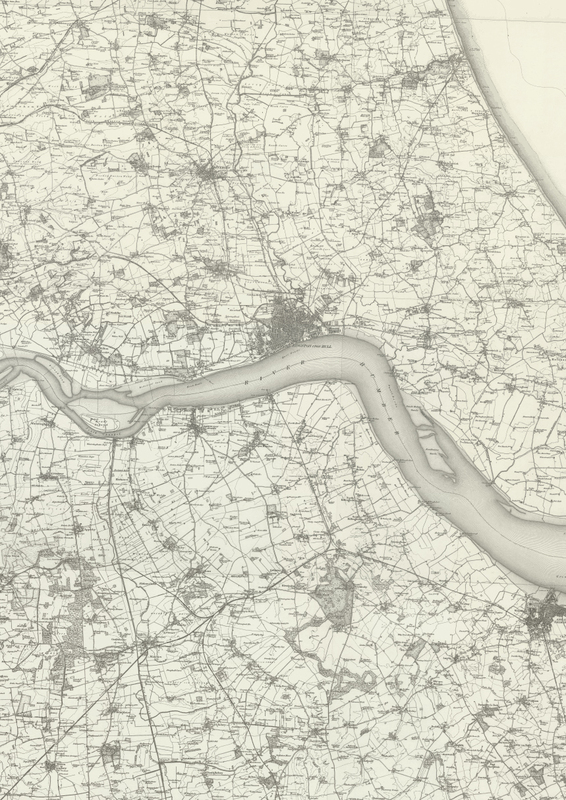 The thick black line outlines the city's boundaries as they were in 1900. Along Broadway in SoHo "SOuth of HOuston (Street)", Manhattan, New York City. Many grand examples of late nineteenth and early twentieth century architecture can be seen in the image above. 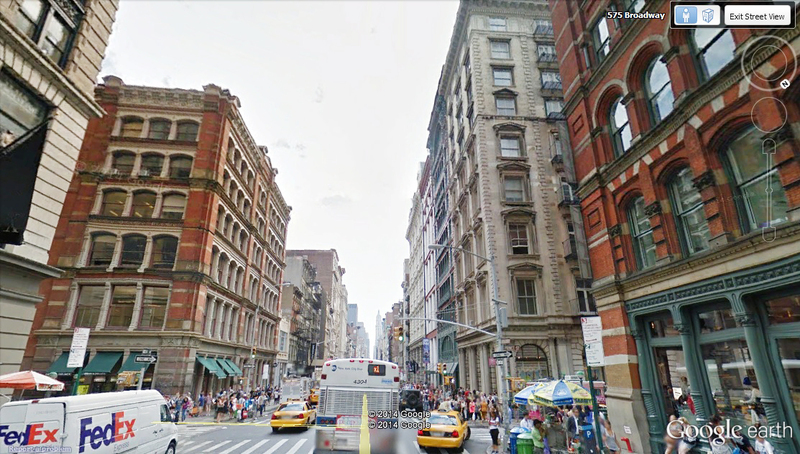 SoHo is famous for containing the largest collection of cast-iron fronted architecture in the world. 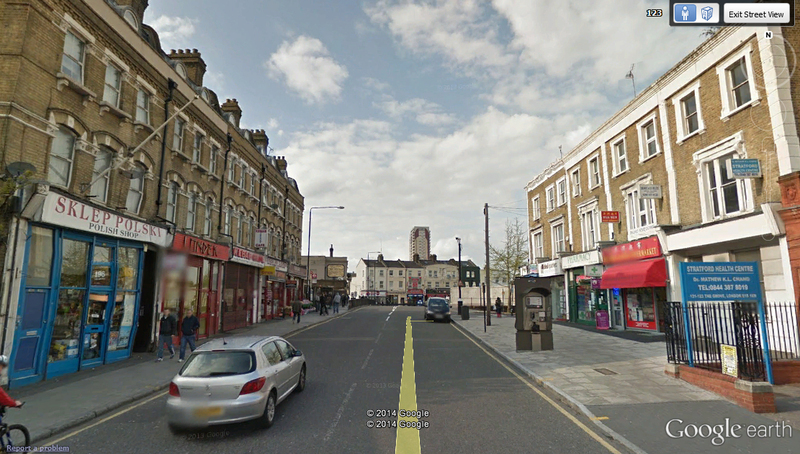 Visible in this image are mostly stone and brick fronted buildings. Explore on Google Street View. 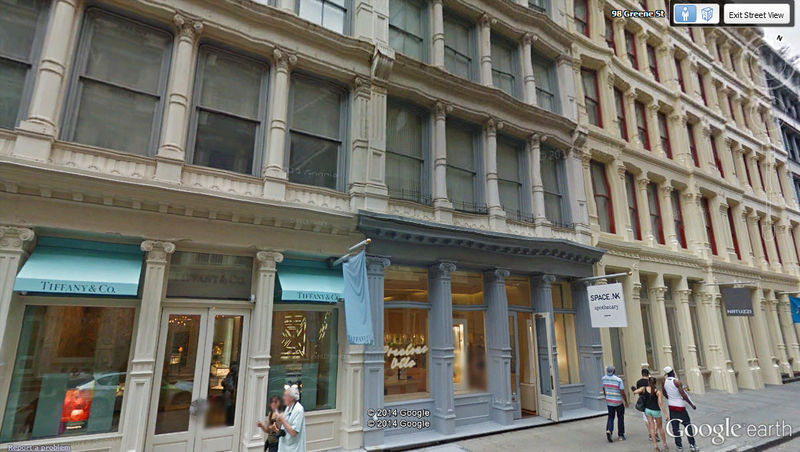 Painted cast-iron fronted buildings along Greene Street in Soho, New York City. Explore on Google Street View. More painted cast-iron fronted buildings along Greene Street in Soho, New York City. 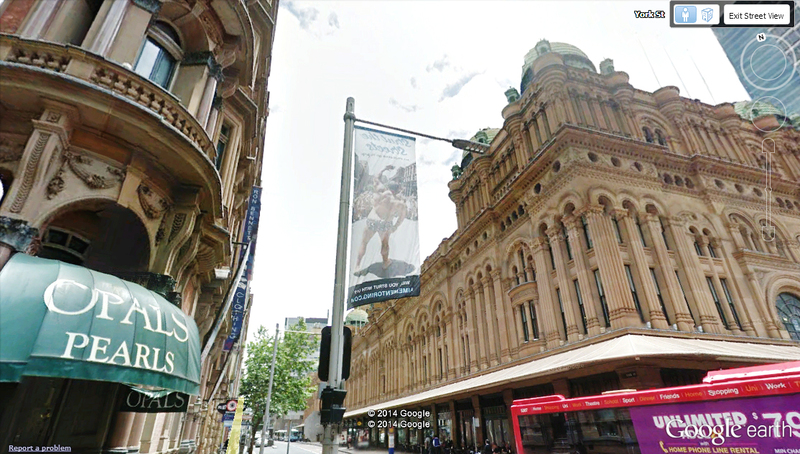 Explore on Google Street View. Notes and Observations: Chicago's population trend displays the typical peak in 1950 and subsequent decline thereafter. 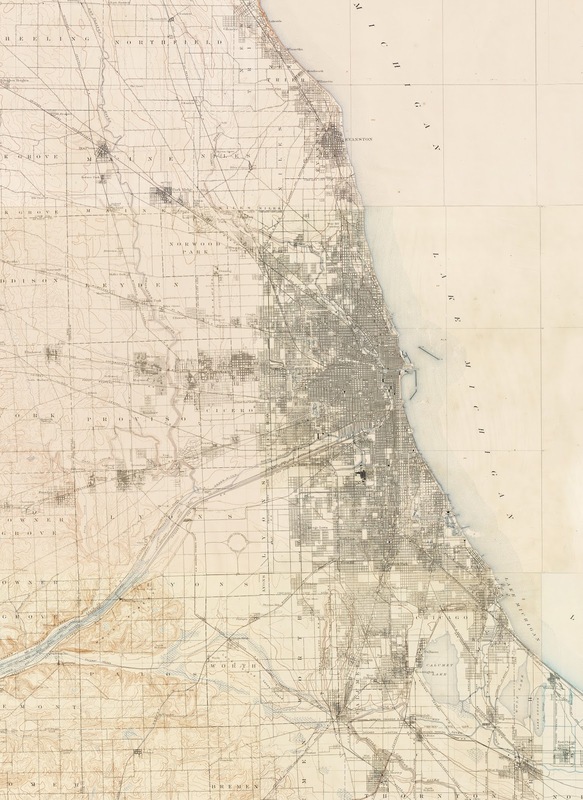 A topographic map of Chicago and vicinity stitched together from sheets dating from 1897-1899 . Chicago is known for being the home of the skyscraper. The first skyscrapers were able to reach heights exceeding seven-stories due to the incorporation of a steel frame structure. 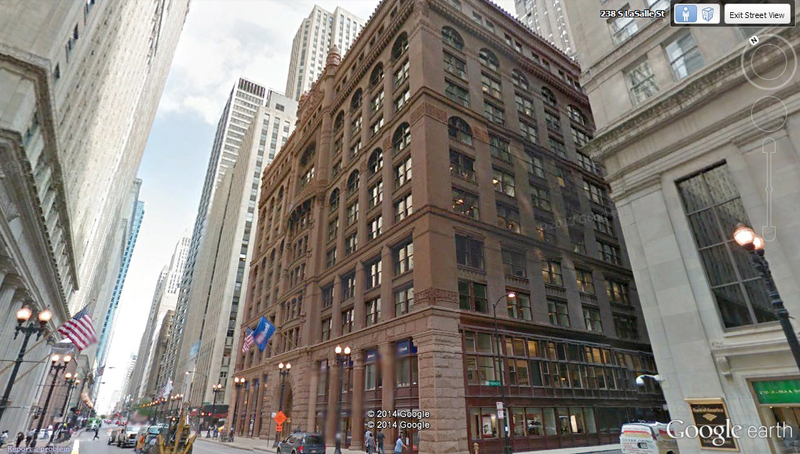 In this image is the Rookery Building, built in 1888, it is considered to be Chicago's oldest still standing high-rise. The surrounding buildings were constructed during the first half of the twentieth century. Explore on Google Street View. When it comes to very large municipalities many times even the Victorian suburbs had their own commercial core as seen above in Lincoln Park. Explore on Google Street View. Notes and Observations: During the eighteenth century Philadelphia had been the most populated municipality in the Thirteen Colonies and subsequently the early United States but by the first official census in 1790 New York City proper had already surpassed Philadelphia. Despite this, Philadelphia still technically had the most populated urban area until the 1810 census when New York City finally surpassed it. 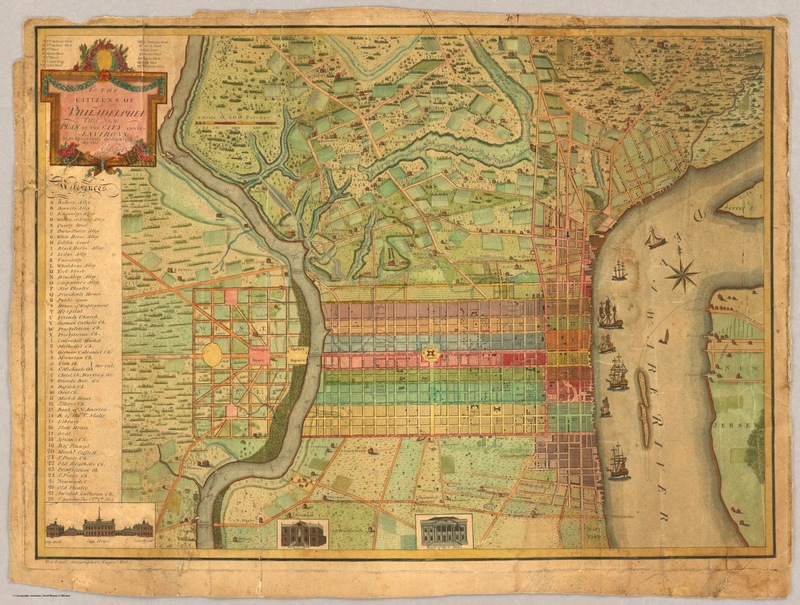 Above is a map of Philadelphia in 1802 from the David Rumsey Collection [44.]. Examine original. On the map above you can see how in 1802 Philadelphia was growing beyond its borders (built up areas are shaded) to the north (Northern Liberties District) and to the south (Southwark District) along the Delaware river but the area within its formal borders (coloured area) extending west to the Schuylkill River remained less developed. Philadelphia is interesting in that it lost population during the 1930's, although its peak wasn't until the 1950 census. The decline in the 1930's could likely have been a result of the Great Depression. Other municipalities which also experienced a brief decline during the 1930's but recovered during the 1940's include Boston, St Louis, Cleveland, and Newark. A topographic map of Philadelphia and vicinity stitched together from sheets dating from 1885-1904 . 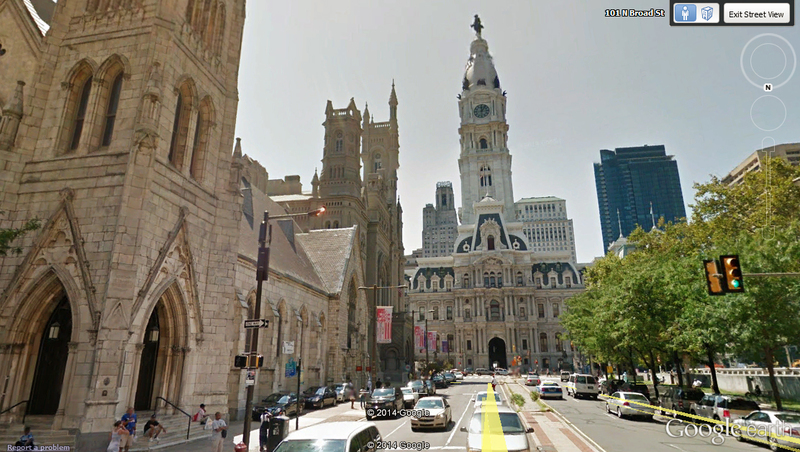 At the end of the street is the Philadelphia City Hall, built 1871-1901. Upon completion it was the tallest habitable building in the world until 1908 (still the world's tallest stone masonry building). In front of it and to the viewer's left is the Masonic Temple which was built 1868-1873. 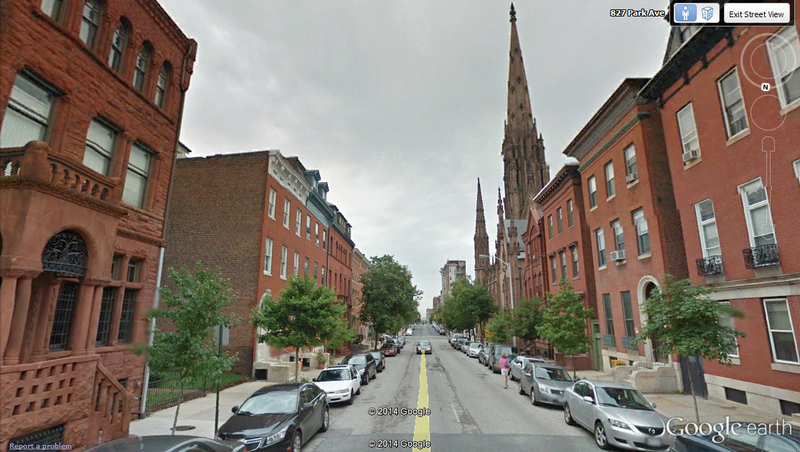 Furthest to the left is the Arch Street United Methodist Church, built 1864-1870. Explore on Google Street View. 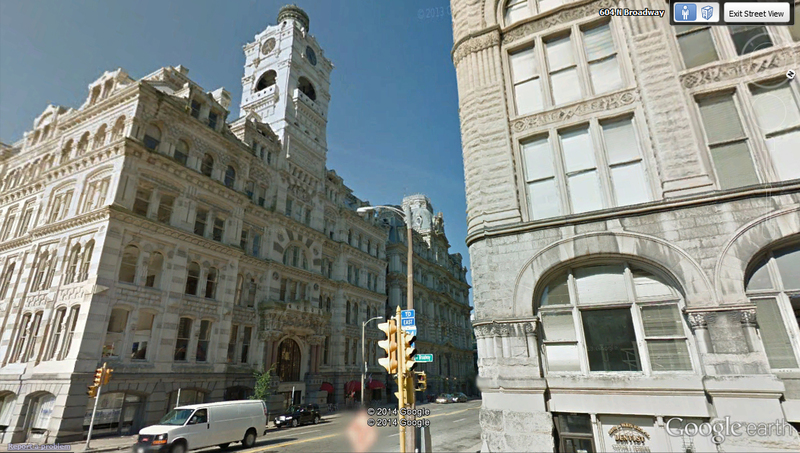 From right to left along what at one point was known as "Bank Row": the Philadelphia Bank Building, completed 1857; others will be named upon new information. Explore on Google Street View. Notes and Observations: In 1912 Glasgow expanded its boundaries and absorbed surrounding communities including Partick and Govan. The population increase can be seen by the 1921 census where Glasgow gained 248,760 more inhabitants since the previous census. Like many other municipalities, Glasgow's population peaked at the 1951 census. A map of Glasgow, Scotland and vicinity. Sheets from an early ordnance survey of Britain, 1885-1900 . 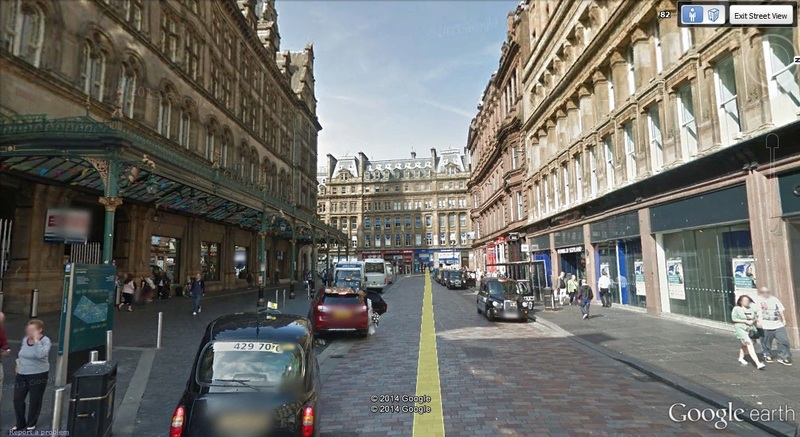 Glasgow Central Station (left), Glasgow, Scotland, United Kingdom. Explore on Google Street View. 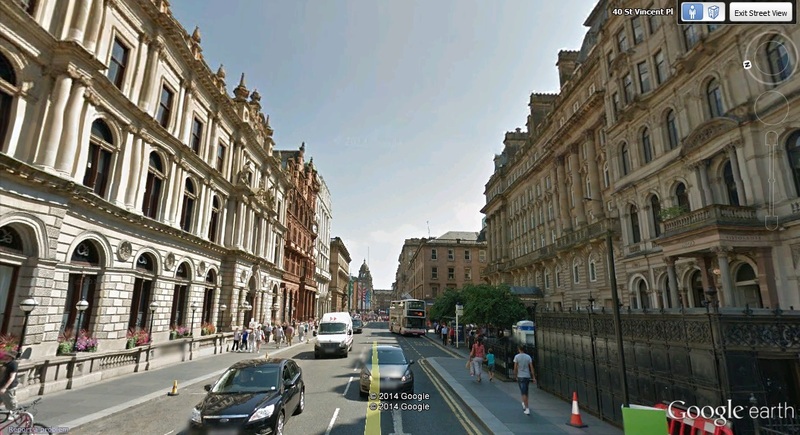 Just west of George Square in Glasgow, Scotland, United Kingdom. Explore on Google Street View. Notes and Observations: Interestingly, Liverpool has experienced quite a decrease in population for a British municipality. Correlated to that has been a significant amount of urban decay and renewal. Despite this, there is still a significant collection of both Georgian and Victorian architecture present in the city. 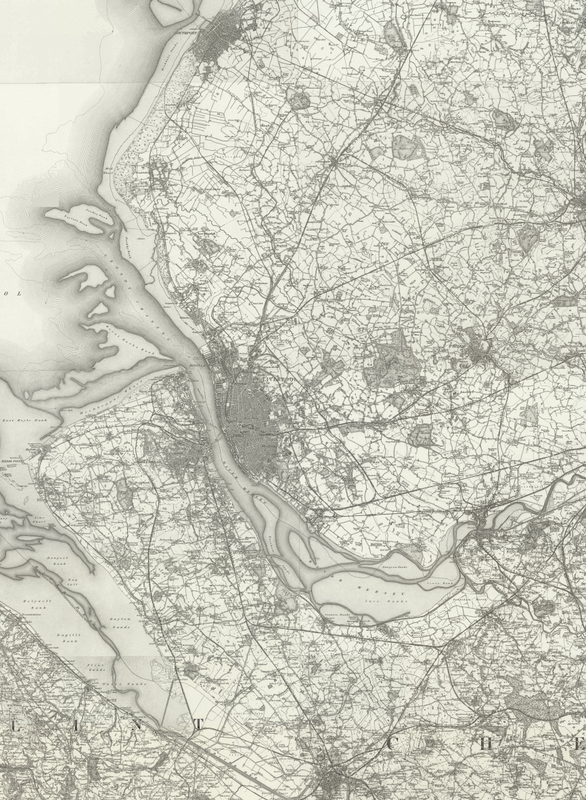 A map of Liverpool, England and vicinity. Sheets from an early ordnance survey of Britain, 1885-1900 . Castle Street terminating at Liverpool's town hall which was built 1749-1754 and is regarded as one of the finest remaining eighteenth century town halls in England. Explore on Google Street View. 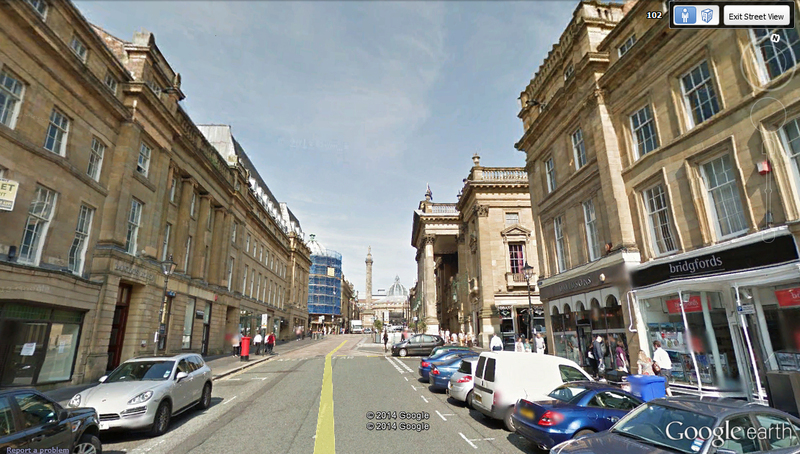 To the left are the Liverpool Municipal Buildings, built 1860-1868. Explore on Google Street View. 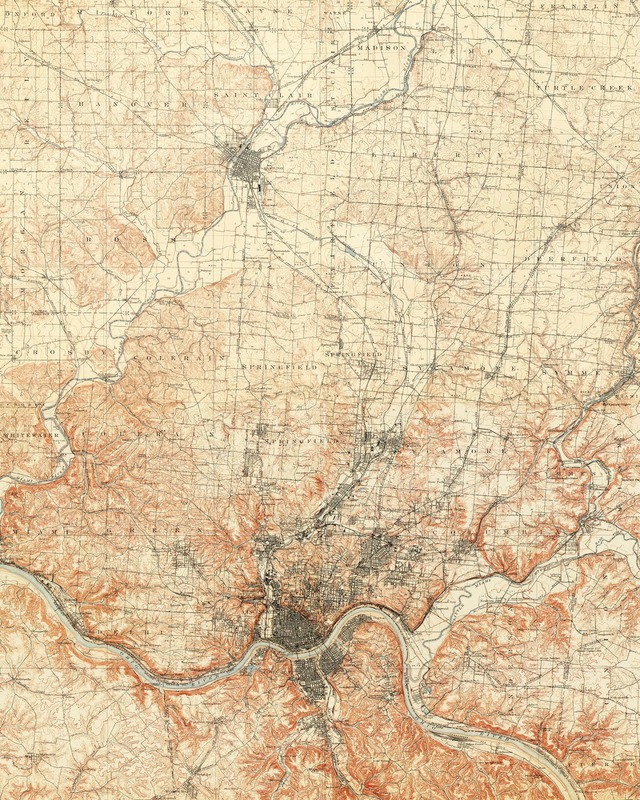 Notes and Observations: St. Louis is one of the oldest settlements in the Midwest being found in 1764 just after it had been transferred from French sovereignty to British under the Treaty of Paris (1763) formally ending the Seven Years' War. It was founded by fur traders and named in honour of King Louis IX of France. Under American control it became a principal port along the Mississippi River. St. Louis' population trend is interesting in that its rate of decrease after its peak in 1950 is greater than its increase prior. Like Philadelphia, Boston, Cleveland, and Newark, St. Louis also experienced a shortly sustained decline in population during the 1930's. 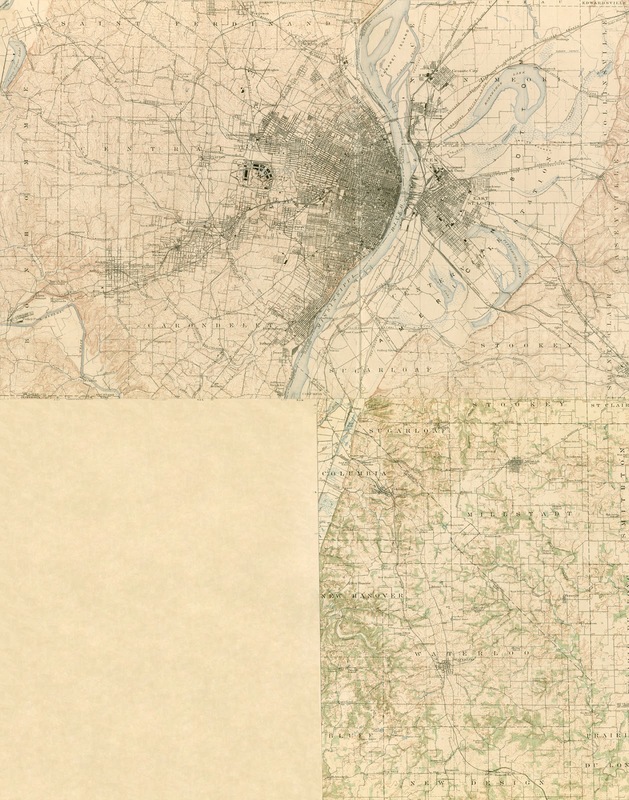 A topographic map of St. Louis and vicinity stitched together from sheets dating from 1903-1910 . The bottom left quarter was unsurveyed at the time. 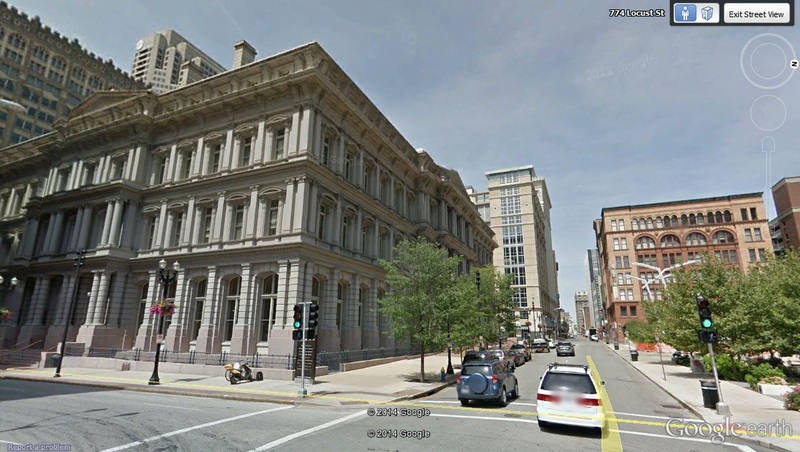 The building taking up an entire block on the left is the United States post office and customs house, built 1873-1884. To the right and in the background is the St. Louis board of education building which was originally built 1891-1893 as the St. Louis public library. 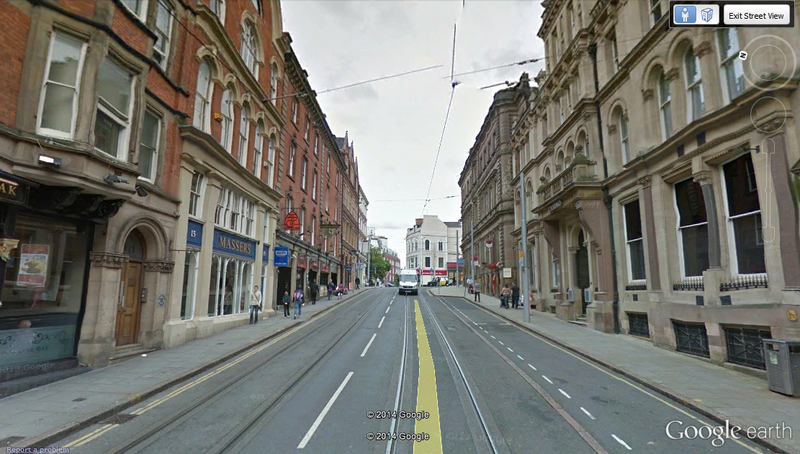 View on Google Street View. 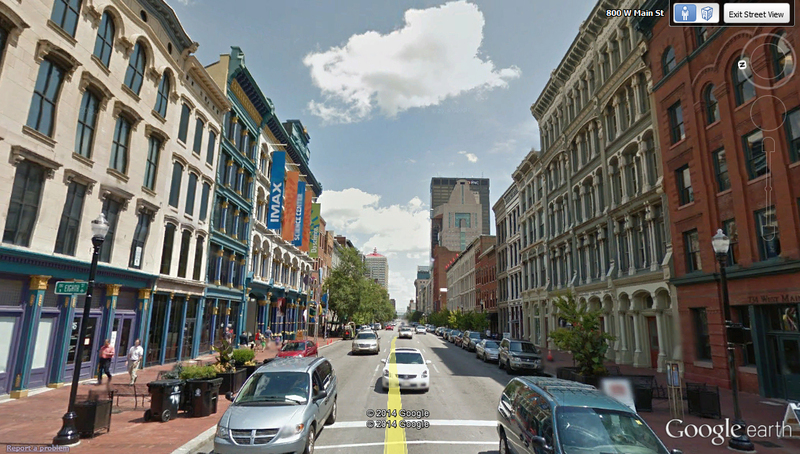 St. Louis, Missouri's old warehouse district is home to a number of high-rises constructed from the 1880's-1940's. The building on the left was built in 1899. Explore on Google Street View. Notes and Observations: A much gentler increase and tapering makes for a visually pleasing chart. One of my hypotheses surrounding the quality of pre-1900 architecture in a municipality is that municipalities that have slowly increased over a much longer period of time will have better examples opposed to a boom-town. Like Philadelphia, St. Louis, Cleveland, and Newark, Boston also experiences a brief decline in population during the 1930's. 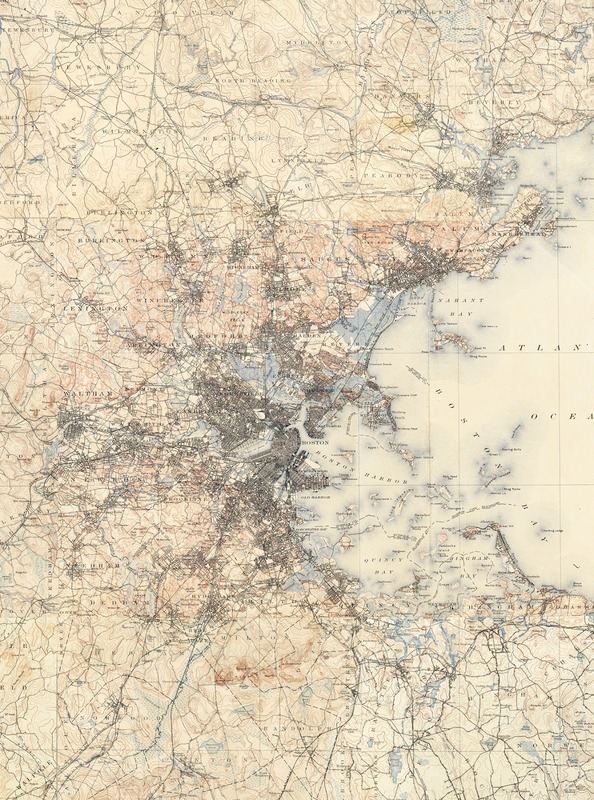 A topographic map of Boston and vicinity stitched together from sheets dating from 1885-1900 . 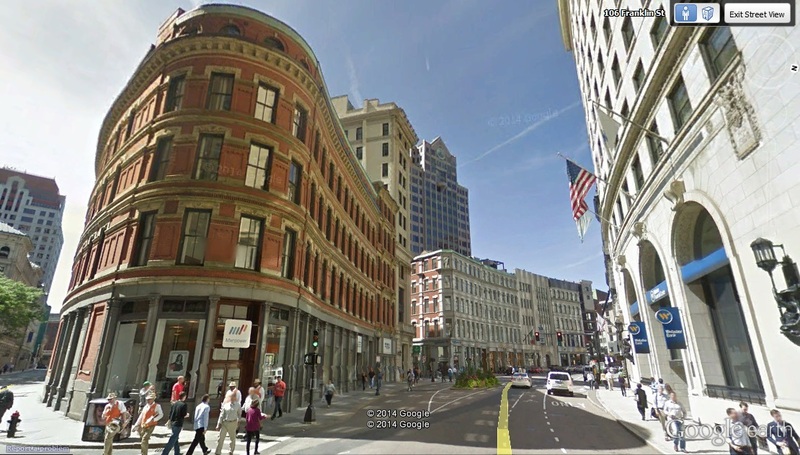 The Wigglesworth Building (left), Boston, Massachusetts. Built in 1873. Explore on Google Street View. Much of Boston's old city centre is built upon a windy network of roads lending the possibility for some pretty interesting façades. Pictured here is the Flour and Grain Exchange which was built 1890-1892 in the Richardsonian Romanesque style. 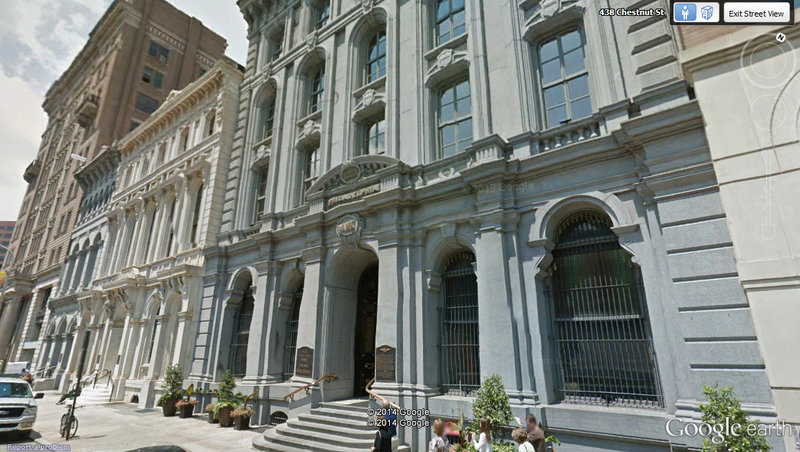 Explore on Google Street View. 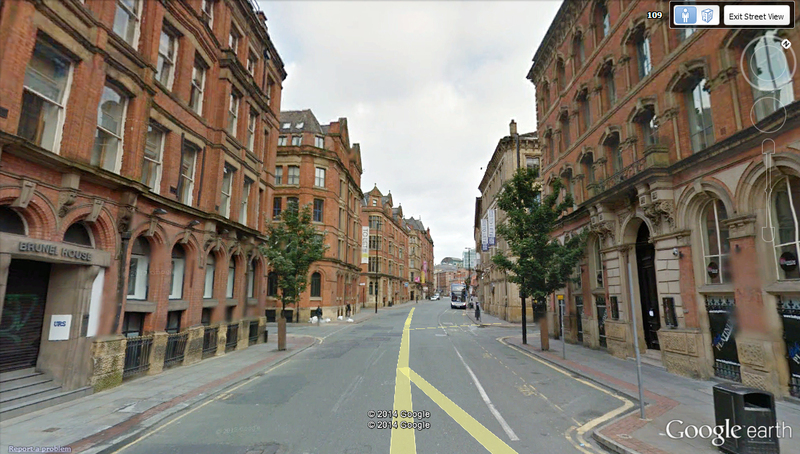 Notes and Observations: Despite Manchester having experienced a fairly noticeable decrease in population due to deindustrialization during the twentieth century, the city still possesses a substantial number of examples of Victorian architecture reflective of the time it boomed. In recent years there has been a substantial amount of investment put into the city which is causing a population turnaround. A map of Manchester, England and vicinity. Salford which is also analyzed in this article comprises much of the western half of the morphological urban area of Manchester. They are separated by the River Irwell. 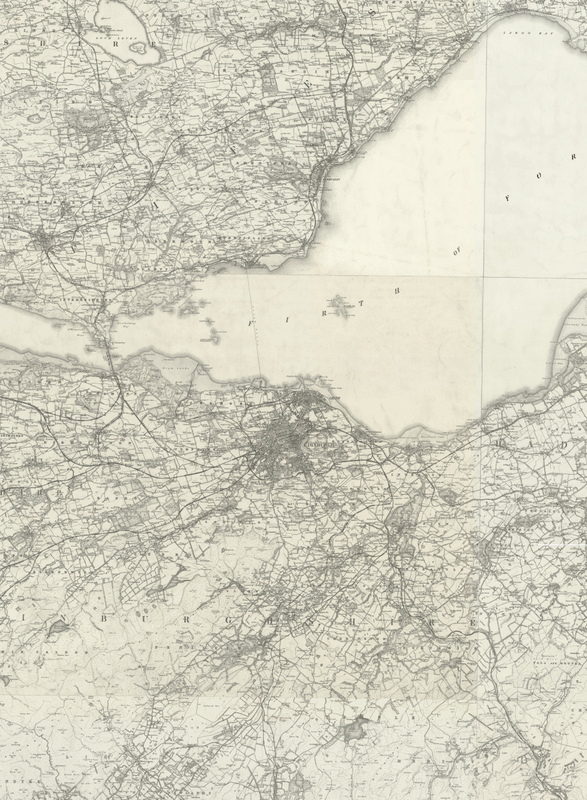 Sheets from an early ordnance survey of Britain, 1885-1900 . 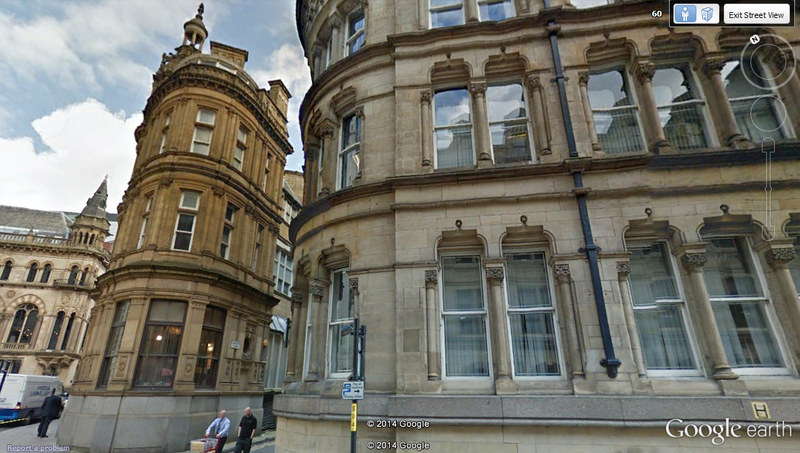 Victorian stone buildings in Manchester. Explore on Google Street View. 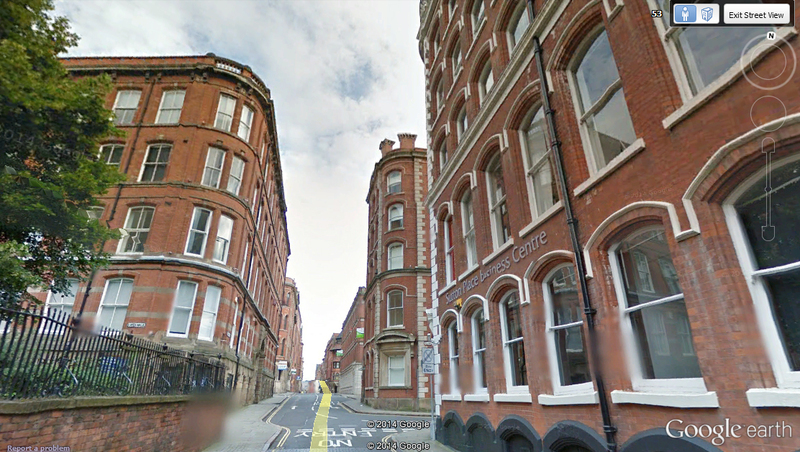 A street lined with Victorian buildings in Manchester. Explore on Google Street View. Notes and Observations: Birmingham was extensively targeted in bombing raids during World War II and subsequently experienced substantial urban development during the 1950's and 1960's. During the post-war period the city experienced significant immigration from other Commonwealth countries leading to its peak at the 1951 census. A map of Birmingham, England and vicinity. Sheets from an early ordnance survey of Britain, 1885-1900 . 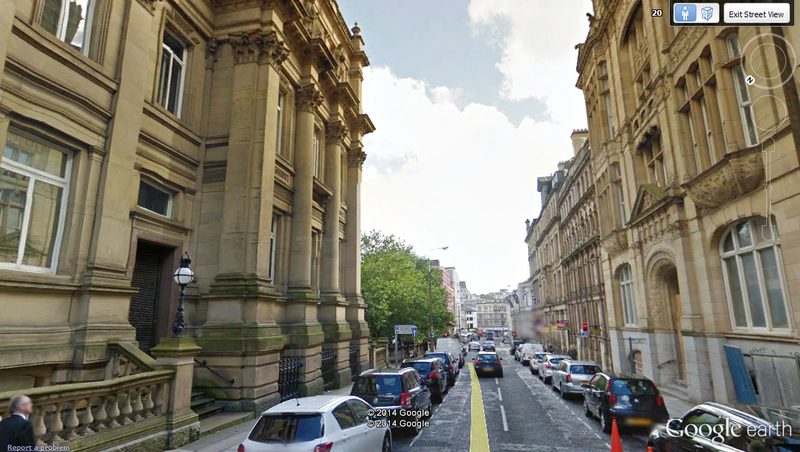 Colmore Row is composed of stone Victorian commercial buildings. Explore on Google Street View. 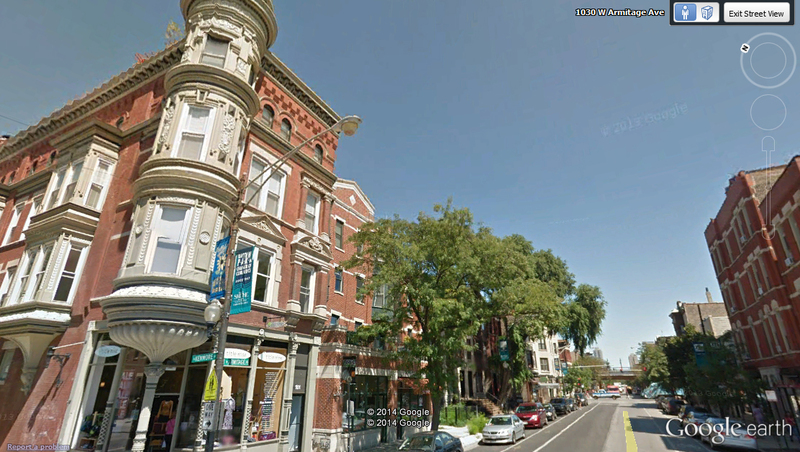 The first building to the left is the Pitman Vegetarian Hotel which opened in 1898. The red stone building further back in the background is the Victorian Law courts which was built 1887-91. 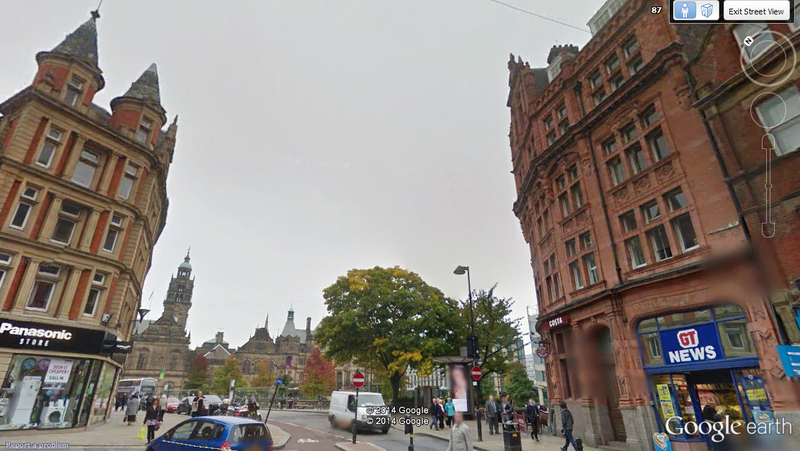 The red stone building to the right of it is the Methodist Central Hall which was built 1903-4. Explore on Google Street View. Notes and Observations: Baltimore is home to substantial examples of pre-1900 architecture but due to suburbanization, urban decay, and racial issues much of the historic infrastructure of the city is in poor repair. 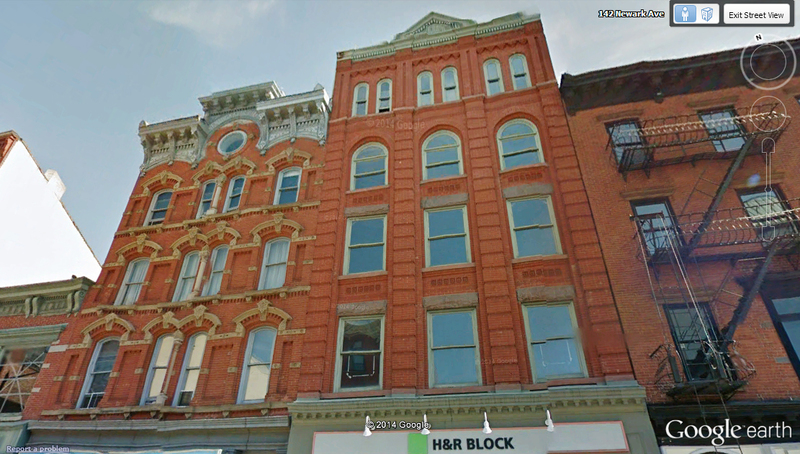 The city is also known for its high prevalence of faux-stone siding which hides original brick façades. Nevertheless, the city still has a number of lovely areas filled with historic architecture. 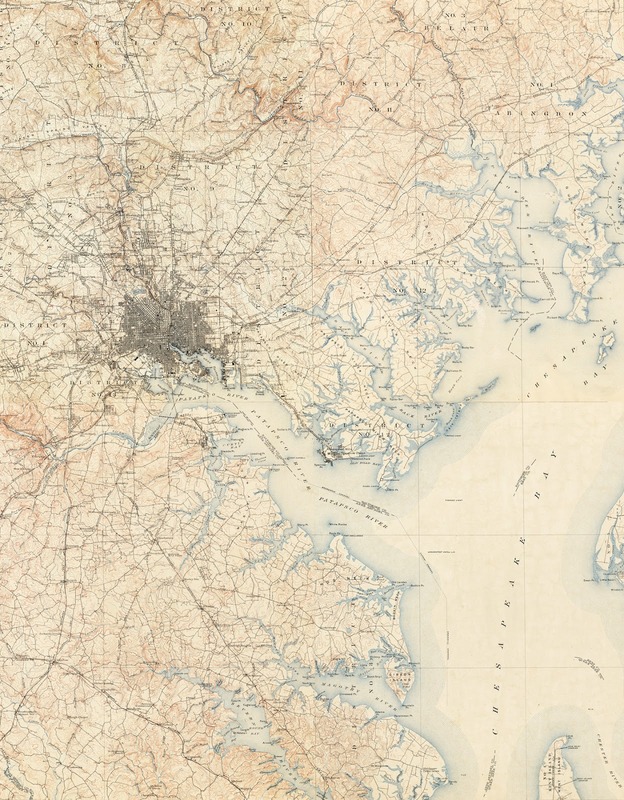 A topographic map of Baltimore and vicinity stitched together from sheets dating from 1900-1905 . To the right is the Central Savings Bank Building, built 1890. To the left is the Fidelity Building, built 1893. The original building contained eight floors but more were added to a total of fifteen in 1912. Explore on Google Street View. 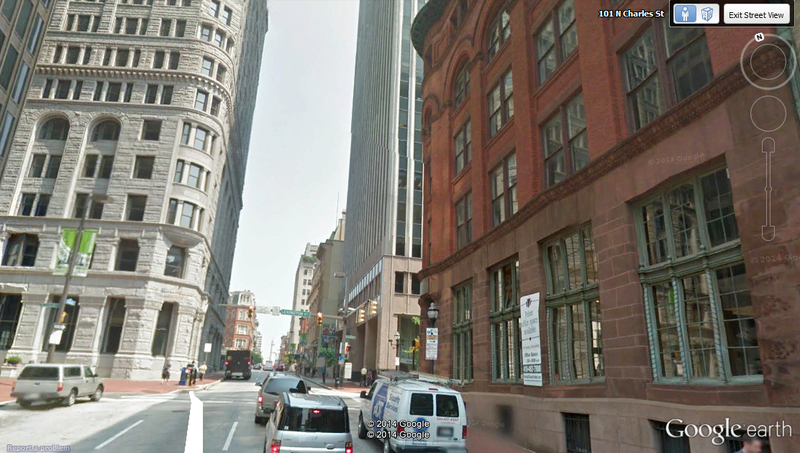 Park Avenue, Baltimore, Maryland. Explore on Google Street View. Notes and Observations: It's interesting that Melbourne and Sydney are the only two municipalities listed in this article that experience consistent positive acceleration curve. New York City's chart which goes above the maximum y-value actually largely plateaus around 7.5 million inhabitants. Despite Melbourne being founded in 1835, forty-seven years after Sydney, by the 1861 census the Melbourne area had overtaken Sydney's as the most populated in Australia. A title it held until the 1911 census when Sydney resumed the title of the most populated. When it comes to Melbourne and Sydney the urban population is used instead of that for the city-proper since municipalities in Australia appeared to grow without changes to municipal boundaries. Instead, each new suburb formed its own municipal corporation and subsequently municipal office. In the Introduction section of this article one of the buildings highlighted was the South Melbourne town hall. A grand Second Empire styled Victorian era building. 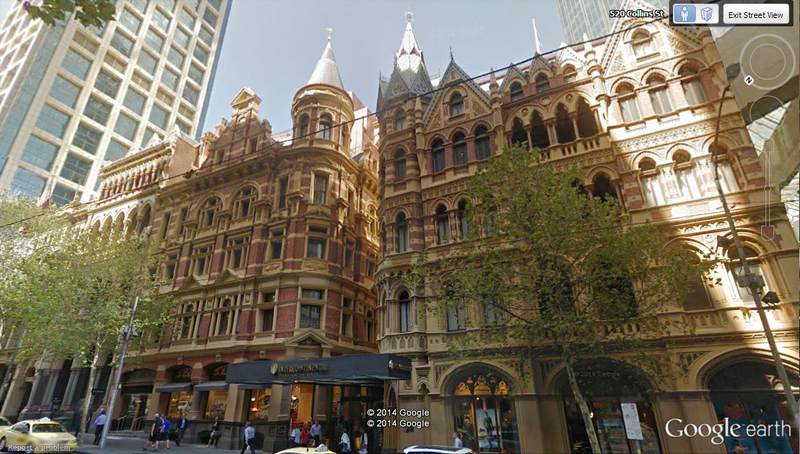 Collins Street is considered to be Melbourne's traditional main street. Explore on Google Street View. 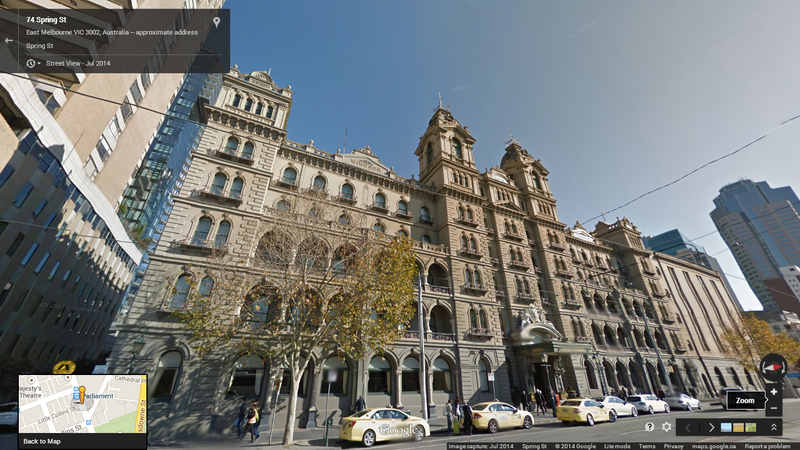 The Grand Hotel (Hotel Windsor), Melbourne, Australia. The first part was built in 1884 and it was extended in 1888. Explore on Google Street View. Notes and Observations: Other than New York City, Sydney possesses the chart that comes closest to reaching the population of London in 1901. In the case of NYC it surpasses it. It also shares one of the only two charts which display a consistent positive acceleration curve. For municipalities in Australia the population of the entire area is used opposed to the city-proper due to how the municipal boundaries didn't appear to grow as the urban area did. Instead suburbs incorporated as towns. Today, the city of Sydney proper is home to only 169,505 inhabitants. 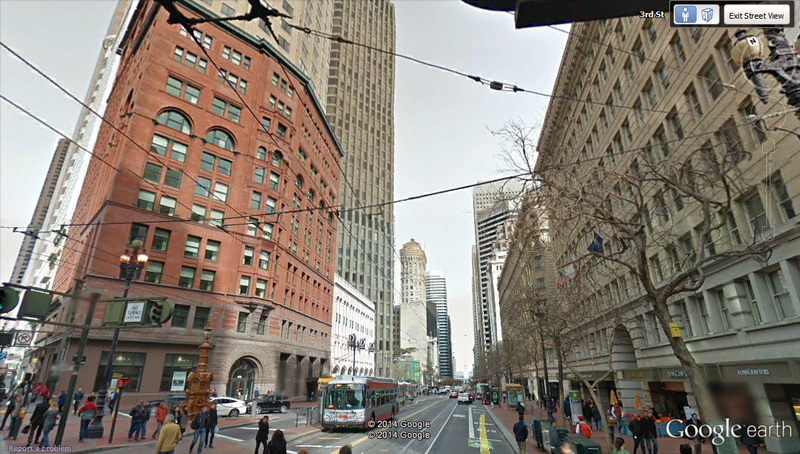 To the right is the Burns, Philps, and Co, Limited's building which was built in 1901. Explore on Google Street View. 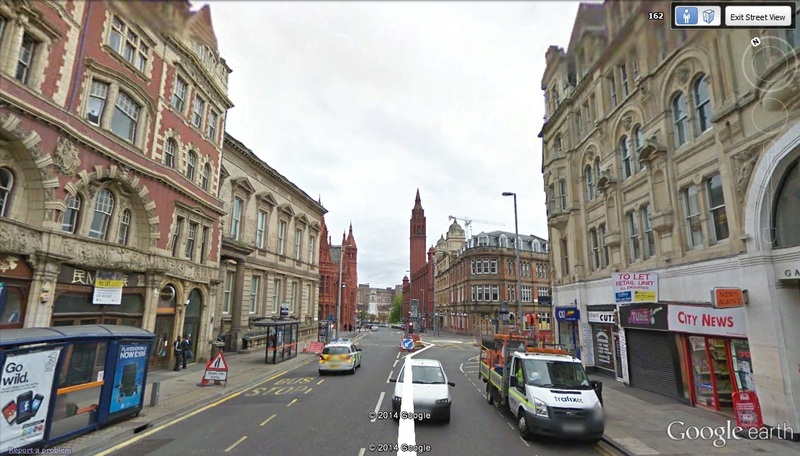 To the right is the Queen Victoria Building which was built 1893-1898. It was designed as a market place. Explore on Google Street View. 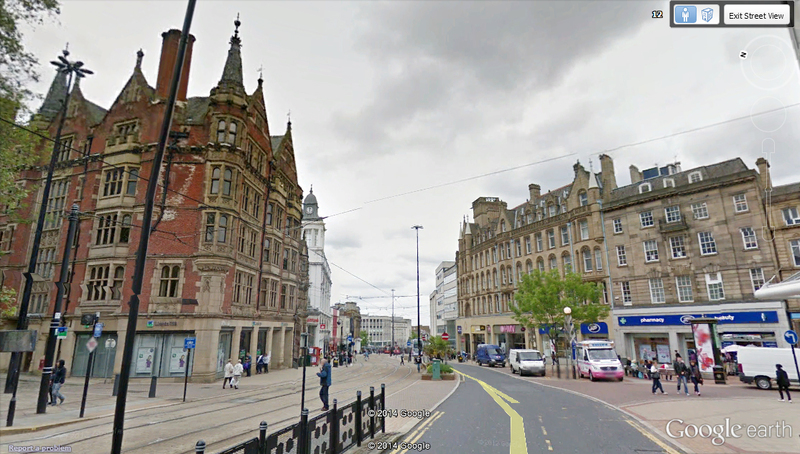 Notes and Observations: The city of Leeds is home to a number of Victorian shopping arcades, markets, and other Victorian era commercial structures. The city's economy has transitioned since the decline of manufacturing leading to a more stable and eventually increasing population trend by modern day. 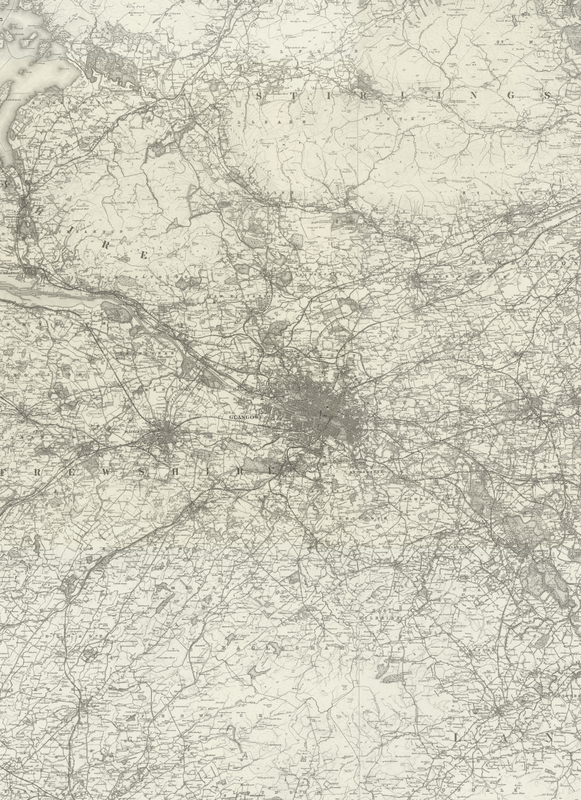 A map of Leeds (large centre on the right, Bradford (large centre on the left, also analyzed in this article), and vicinity. 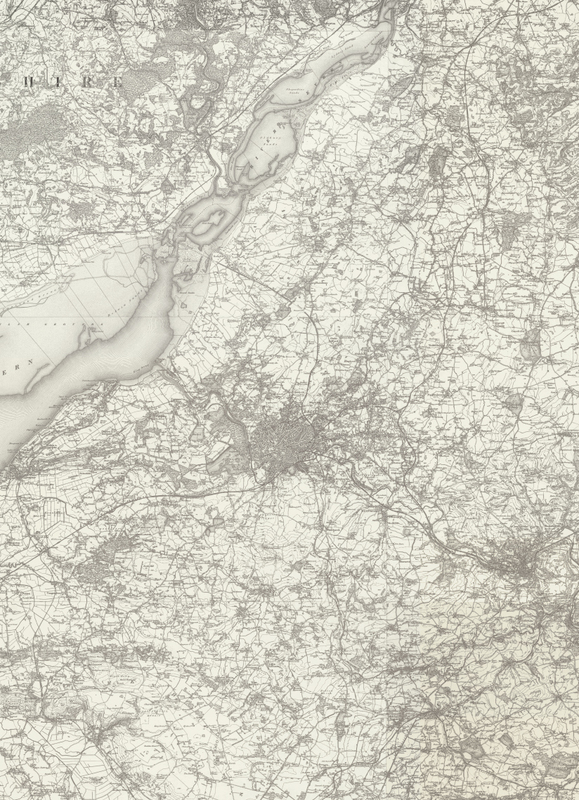 Sheets from an early ordnance survey of Britain, 1885-1900 . 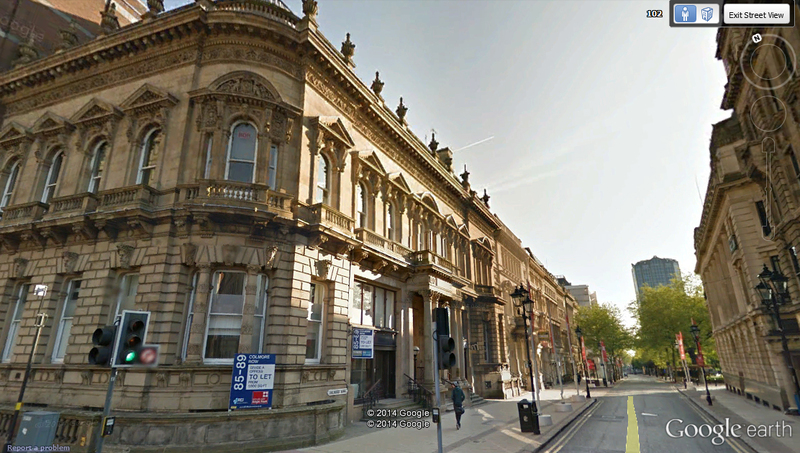 Nineteenth century buildings in Leeds. Explore on Google Street View. 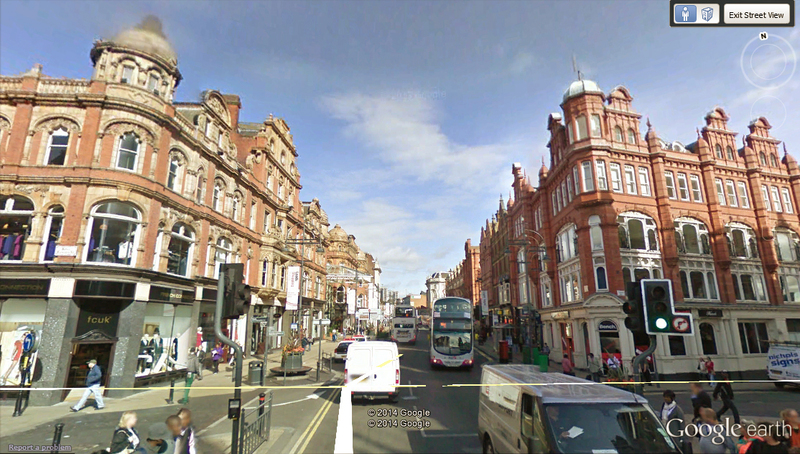 A Victorian shopping district in Leeds. Explore on Google Street View. Notes and Observations: Like Philadelphia, Boston, Newark, and St. Louis, Cleveland also experiences a brief decline in population during the 1930's. Like Buffalo, Cleveland also presents a remarkable hump in its population curve. 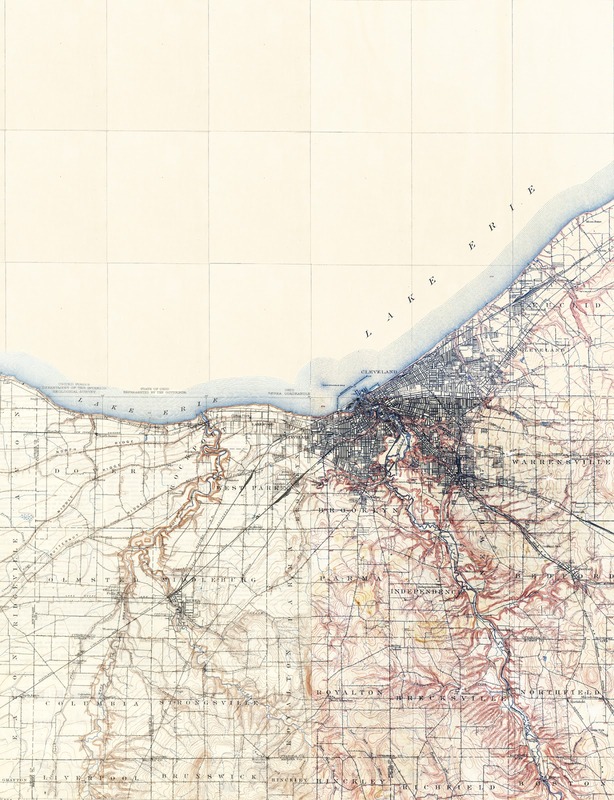 A topographic map of Cleveland and vicinity stitched together from sheets dating from 1901-1902 . 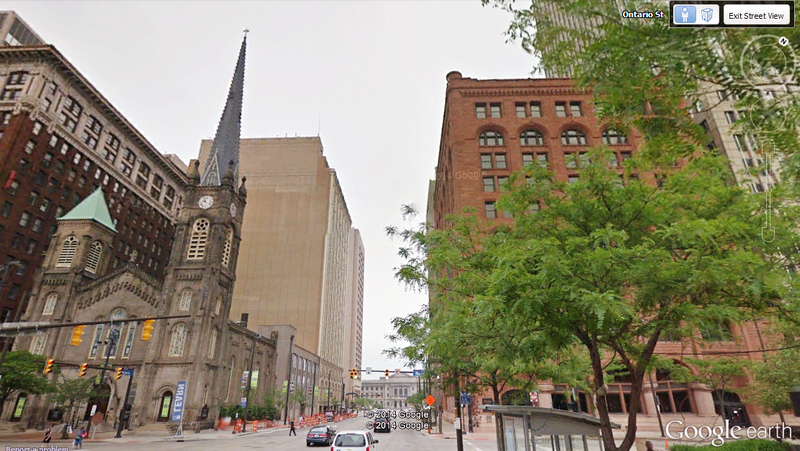 Cleveland still has at least a handful of Victorian vintage structures still standing. Among them include Victorian arcades (early shopping malls) and Victorian skyscrapers. 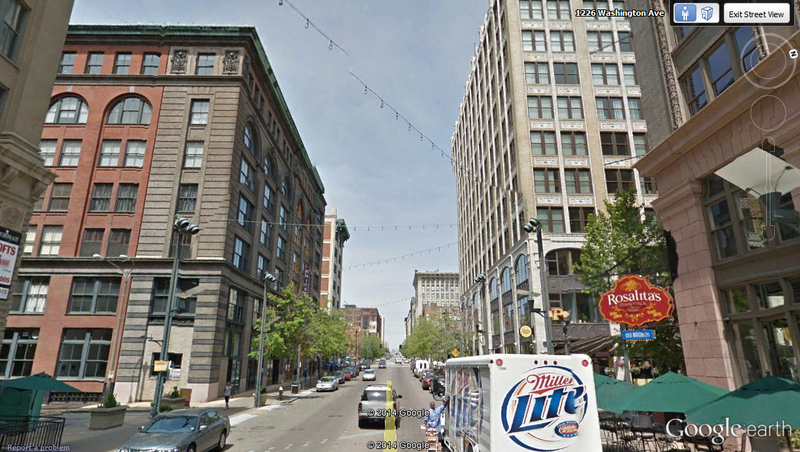 Pictured above is a section of Cleveland near the waterfront that still has a number of Victorian buildings in tact. 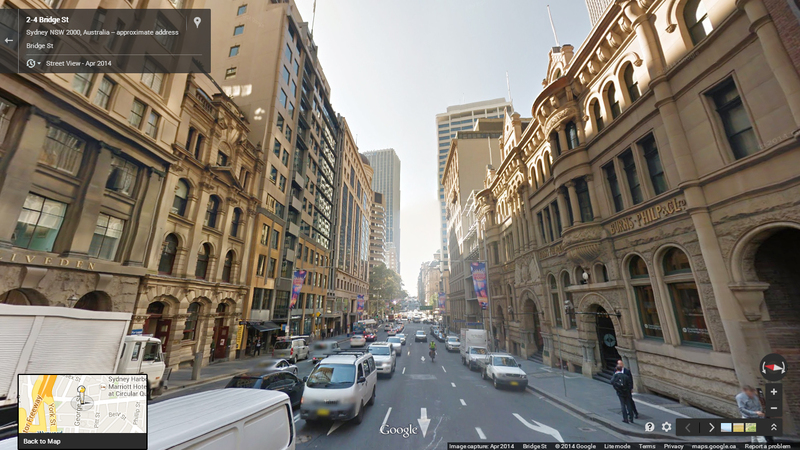 Explore on Google Street View. To the right is the Society for Savings Building which was built in 1889 and stood as the tallest building in the city until 1896. The building is considered to be the first modern skyscraper in the state of Ohio. The church to the left is the Old Stone Church which was built in 1855. 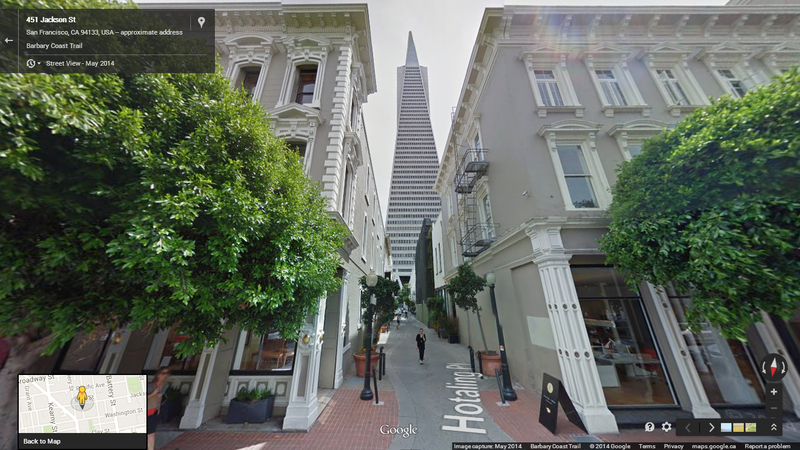 Explore on Google Street View. Notes and Observations: Sheffield's population has been relatively consistent within the twentieth century. A map of Sheffield, England and vicinity. 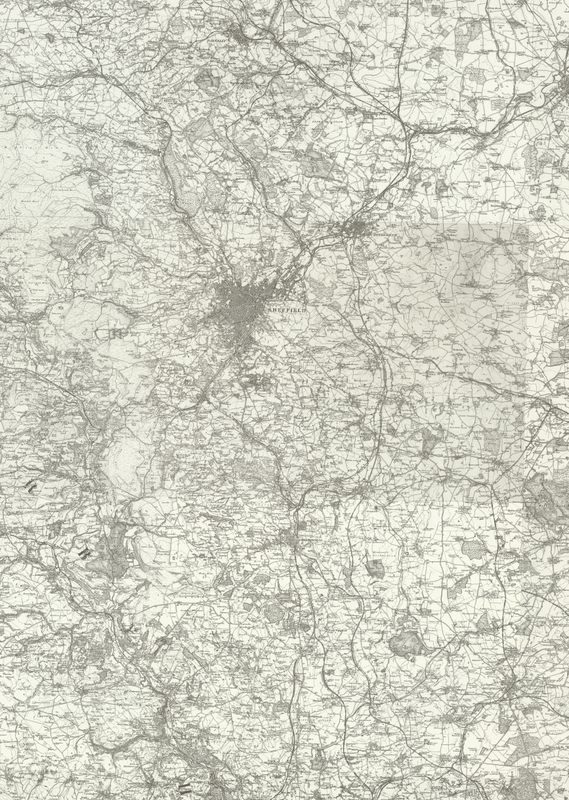 Sheets from an early ordnance survey of Britain, 1885-1900 . Explore on Google Street View. 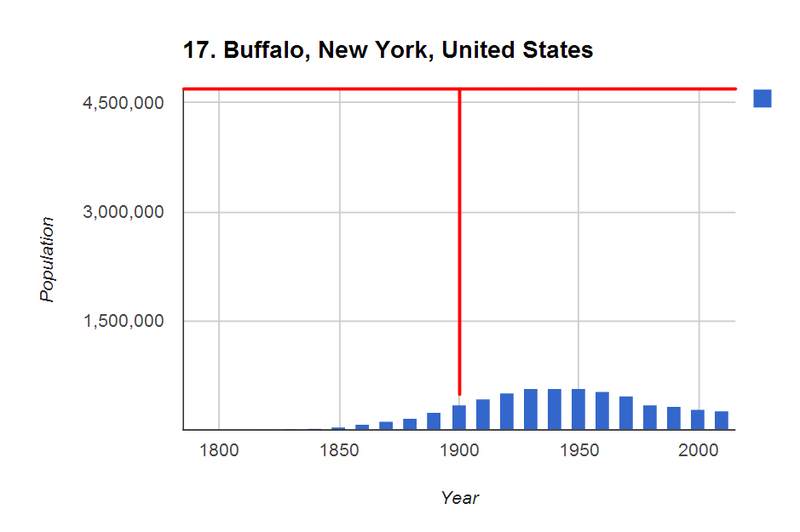 Notes and Observations: Buffalo's population trend is quite archetypal of what I'd expect for a postindustrial municipality. Its rate of decrease is roughly that of what its increase was creating a nice hump in the graph reminiscent of Cleveland's trend. 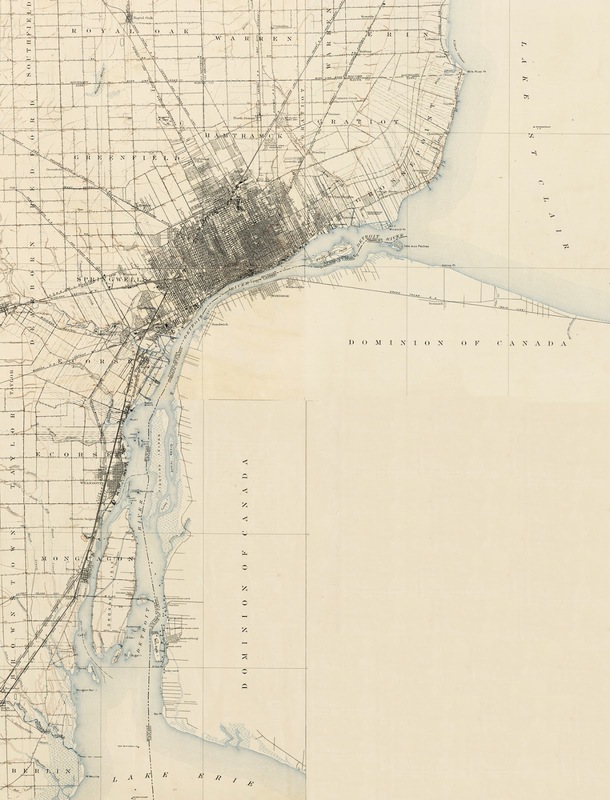 A topographic map of Buffalo and vicinity stitched together from sheets dating from 1893-1904 . 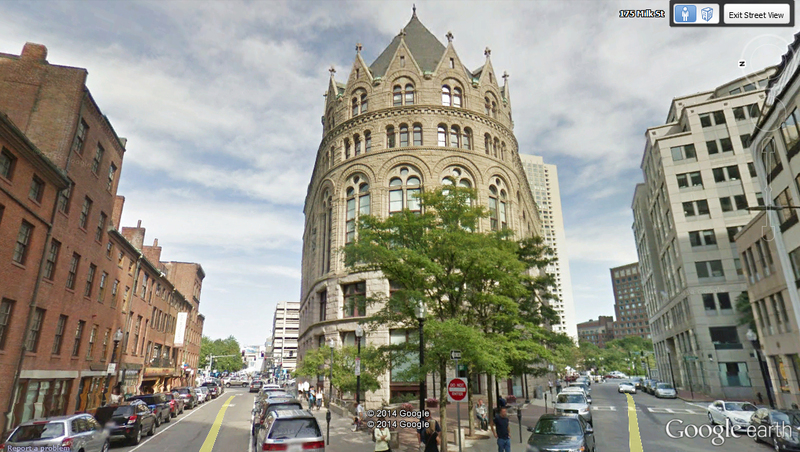 The Ellicott Square Building (left) was built in Buffalo in 1896 and upon completion it was the largest office building in the world. Explore on Google Street View. To the right is the Guaranty Building which was designed by Louis Sullivan and Dankmar Adler. It was built in 1894 and is an example of a Victorian skyscraper. To the left is St. Paul's Cathedral. It was largely built in 1851. Explore on Google Street View. Notes and Observations: From the 1891 to the 1921 census Belfast was the most populated municipality on all of Ireland surpassing Dublin. Belfast's population trend is fairly reminiscent of Cleveland's and Buffalo's in that it depicts a "hump" due to population decline. 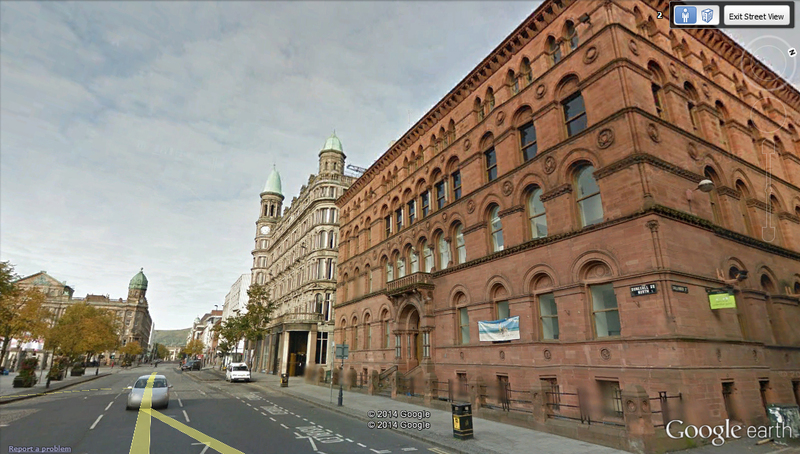 Victorian buildings surrounding Donegall Square in Belfast, Northern Ireland. Explore on Google Street View. Notes and Observations: Although San Francisco was founded in the eighteenth century, it didn't experience much of a population until the gold rush around 1850. Unlike the typical trend shown for a postindustrial American municipality, San Francisco's population trend does not depict much of a "hump". Due to San Francisco's location on the west coast of North America many people might be surprised as to how prominent the centre was during the Victorian days. 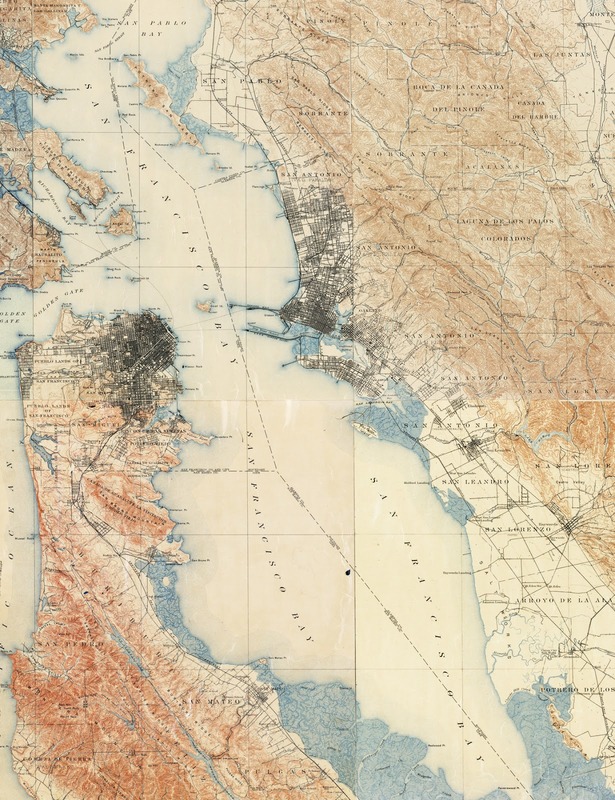 A topographic map of San Francisco and vicinity (San Francisco is on the west side of the bay and Oakland on the opposite) stitched together from sheets dating from 1892-1896  Scale: 1:62,500. Due to the 1906 San Francisco earthquake and subsequent fire nearly all of the Victorian city centre was destroyed (80% of the entire city at the time). There were at least a few exceptions though. A handful were built to be fireproof including the brick-faced Victorian skyscraper in the left of this image. 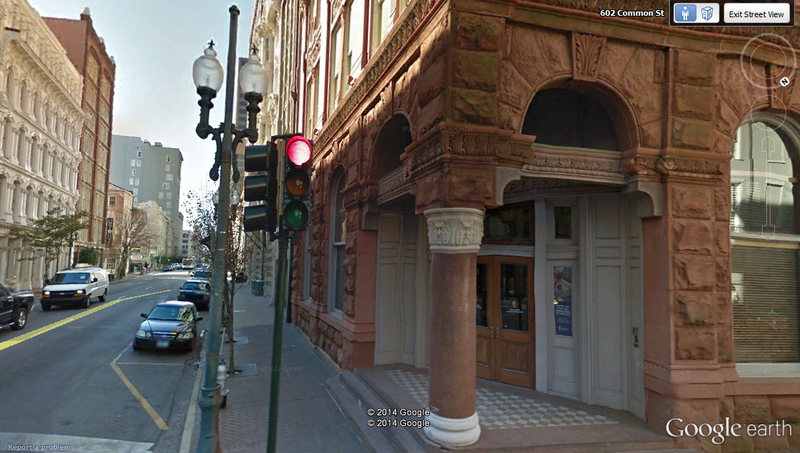 It was built in 1889 as the Chronicle Building. Victorian neighbourhoods at the periphery of the city also survived since the fires didn't extend all the way to them. Explore on Google Street View. To the left is the A.P. Hotaling & Co.'s Jackson Street whisky warehouse which was built in 1866 and amazingly survived the 1906 earthquake and fire due to a mile long fire hose laid down by the U.S. Navy. To the right is another Victorian building. Explore on Google Street View. Notes and Observations: Bristol's population trend has fairly constant within the twentieth century. A map of Bristol, England and vicinity. Sheets from an early ordnance survey of Britain, 1885-1900 . A mixture of Georgian and Victorian era buildings along Corn Street in Bristol. Many of these were used as banks and exchanges. Explore on Google Street View. 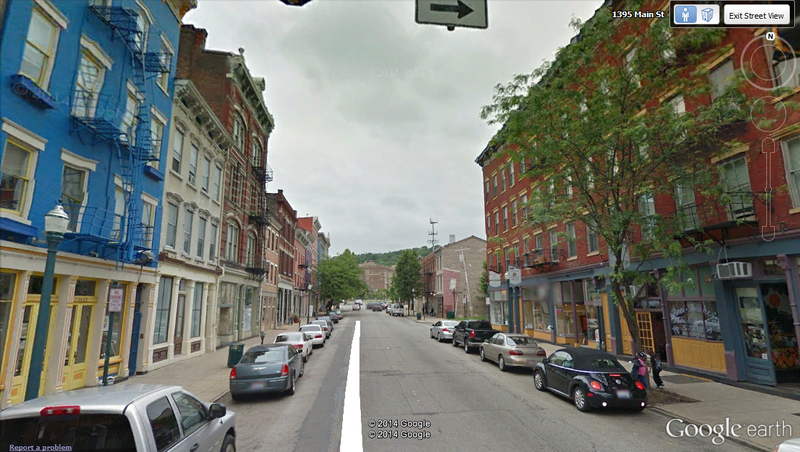 Notes and Observations: The city is considered the first boom town west of the Alleghenies. It quickly rose up to the eighth most populated municipality in the United States by the 1830 census. Its population trend depicts a fairly smooth growth and subsequent decrease in population. It's a gentle "hump" that doesn't express any periods of accelerated growth or decline. 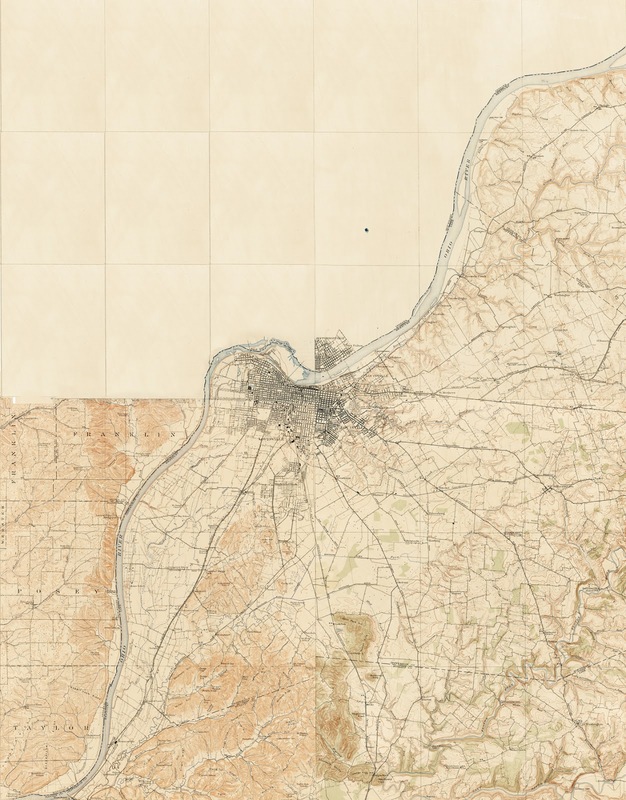 A topographic map of Cincinnati and vicinity stitched together from sheets dating from 1903-1912 . Along Main Street, Cincinnati, Ohio. 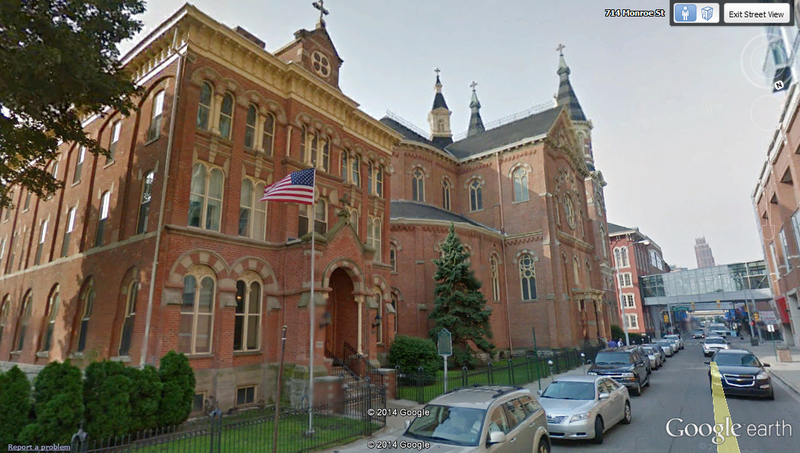 The city is considered to contain the largest amount of Victorian Italianate architecture in all of the United States. Explore on Google Street View. 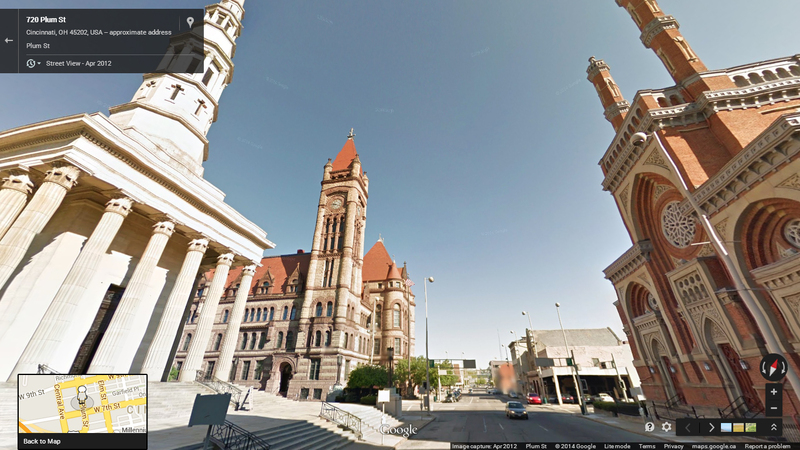 To the left is Saint Peter in Chains Cathedral, built 1841-1845; middle is the Cincinnati city hall, built c. 1888; right is the Isaac M. Wise Temple, the synagogue was built in 1865. Explore on Google Street View. Notes and Observations: The greatest increase Pittsburgh ever experienced was between the 1900 and 1910 censuses. During this time it annexed the nearby city of Allegheny which itself in 1900 was the twenty-seventh most populated municipality in the USA with a population of 129,896 inhabitants. 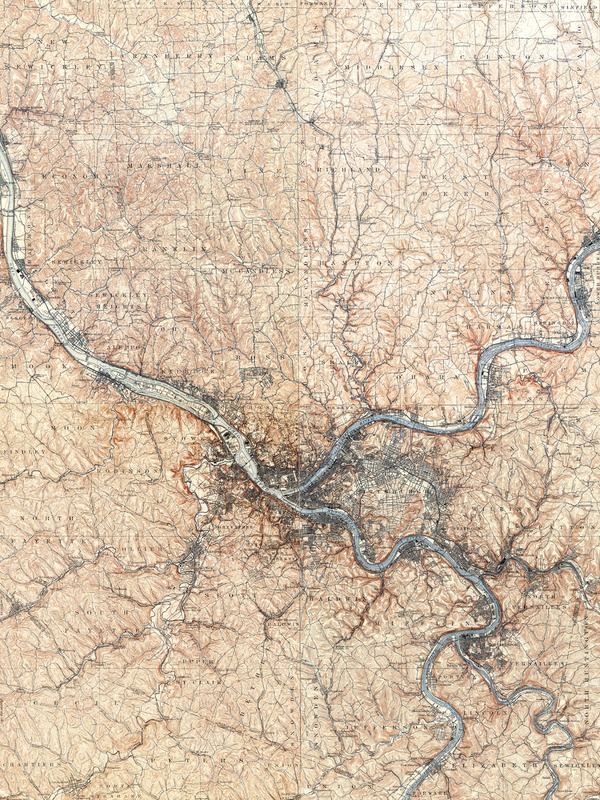 A topographic map of Pittsburgh and vicinity stitched together from sheets dating from 1904-1908 . 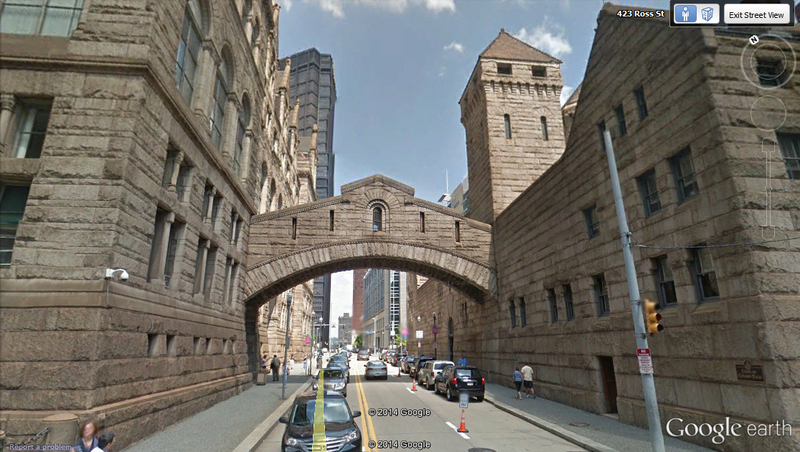 To the left is the Allegheny County Courthouse and to the right is the Allegheny County Jail in Pittsburgh, Pennsylvania. They were completed in 1888 and are examples of the Richardsonion Romanesque style that was quite popular at the time for public buildings. The style was also seen earlier in this article with Toronto's old city hall. Explore on Google Street View. To the left is the Granite Building, built 1890. 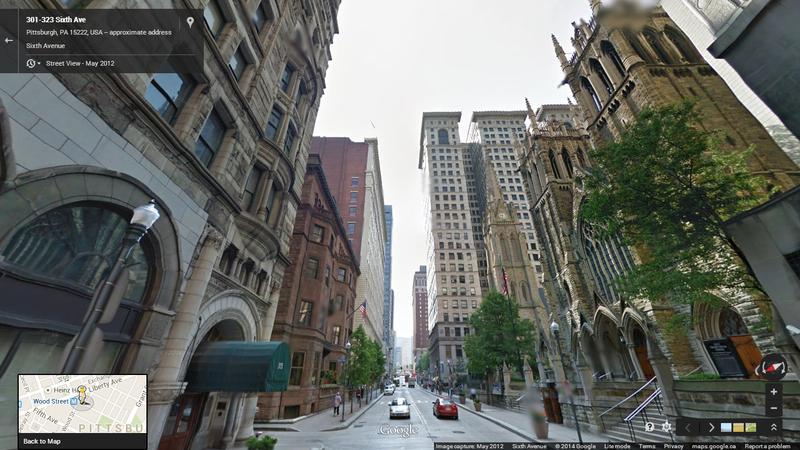 To the left and further down the street is Duquesne Club, built 1887. The church to the right is the First Presbyterian Church, built 1903. 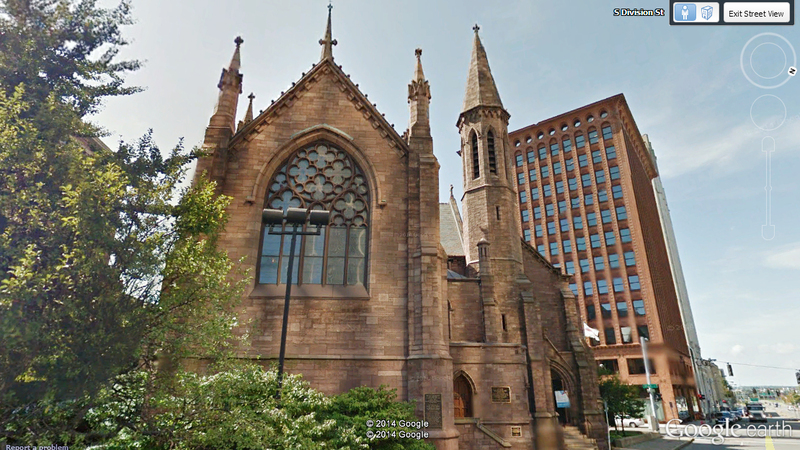 Further down the street is the Trinity Cathedral, built 1872 and upon completion was the tallest structure in Pittsburgh until the Allegheny Courthouse was completed in 1888. Explore on Google Street View. 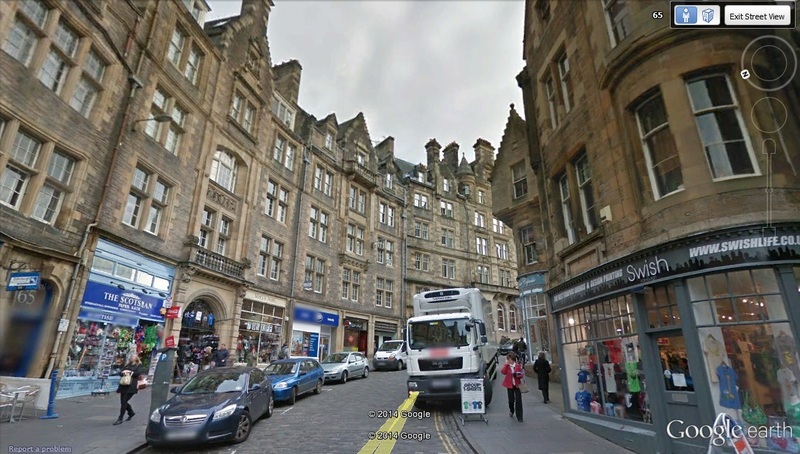 Notes and Observations: In my opinion Edinburgh is one of the most visually pleasing of the municipalities listed in this article. Since 1921 the population has been fairly consistent, not dropping below 400,000. A map of Edinburgh, Scotland and vicinity. Sheets from an early ordnance survey of Britain, 1885-1900 . Cockburn Street, Edinburgh, Scotland. It was laid out in 1856. Explore on Google Street View. Notes and Observations: 1921 and prior, Dublin is included in the rankings of the municipalities of the United Kingdom. By the next census though it would no longer be part of the Kingdom and since then ranks as #1 in all of the Republic of Ireland. For a brief period after the Act of Union 1800 when Ireland entered the United Kingdom, it enjoyed the title of being the second most populated city in the Kingdom. From the 1891 to 1921 censuses, Dublin was only the second most populated municipality on the Island of Ireland behind that of Belfast. The corner of Grafton and Nassau Streets in Dublin Ireland. 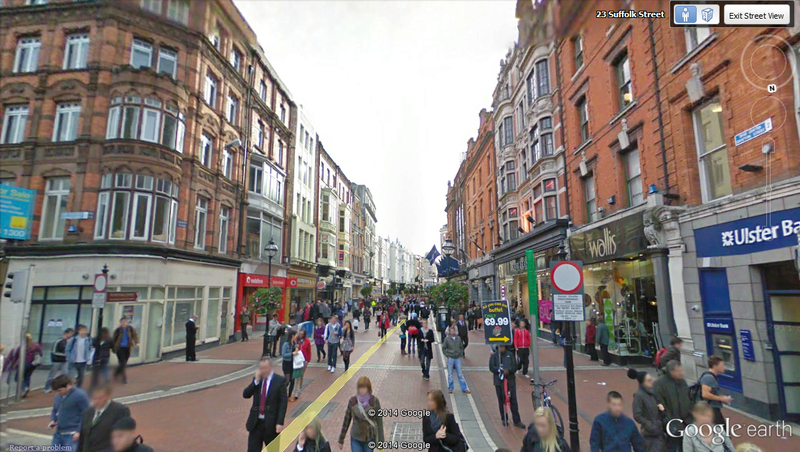 Dublin didn't grow as much during the Victorian era as it did before and after it. Georgian architecture which Dublin is better known for is much more abundant. Explore on Google Street View. Notes and Observations: There's a noticeable drop in population following the decade that Hurricane Katrina occurred. It's an oddity that the population peaked in 1960 opposed to the more common 1950 found for most American municipalities. 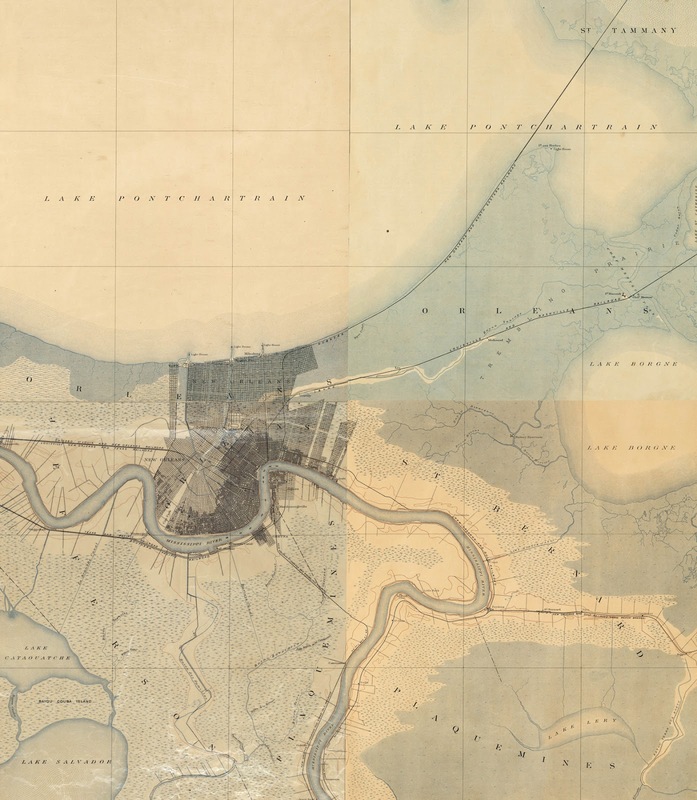 A topographic map of New Orleans and vicinity stitched together from sheets dating from 1890 . The American District of New Orleans at one point contained many Victorian buildings, many of them being Italianate in design. Pictured here is a rusticated first storey of a Victorian building to the right and an eclectic cast iron fronted Victorian to the left further down the street on the left. Explore on Google Street View. Notes and Observations: Detroit's population trend is quite remarkable. It conforms to the trend of American municipalities peaking in population at the 1950 census. The rise of automobile production in the twentieth century saw the most dramatic and aggressive increases to Detroit's population and the subsequent suburbanization and deindustrialization after 1950 contributed to the population dropping off at a pretty constant rate. During the eighteenth century Detroit was the most populated municipality in New France between Montreal and New Orleans. In the late eighteenth century after Quebec was ceded to Great Britain, Detroit was the third most populated municipality in the Province of Quebec with only Montreal and Quebec City ranking higher. 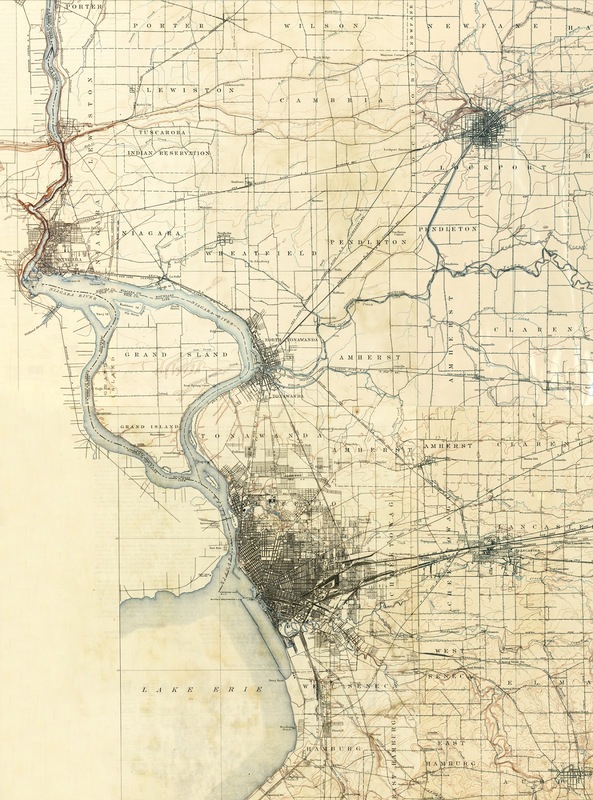 A topographic map of Detroit and vicinity stitched together from sheets dating from 1904 . The St. Mary Roman Catholic Church and rectory are located in historic Greektown in Detroit. Built 1876. 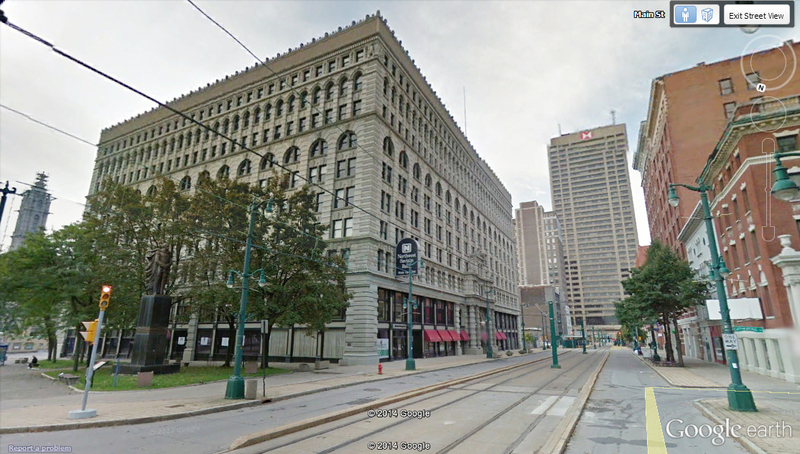 Victorian buildings are difficult to come by in Detroit's city centre. Explore on Google Street View. 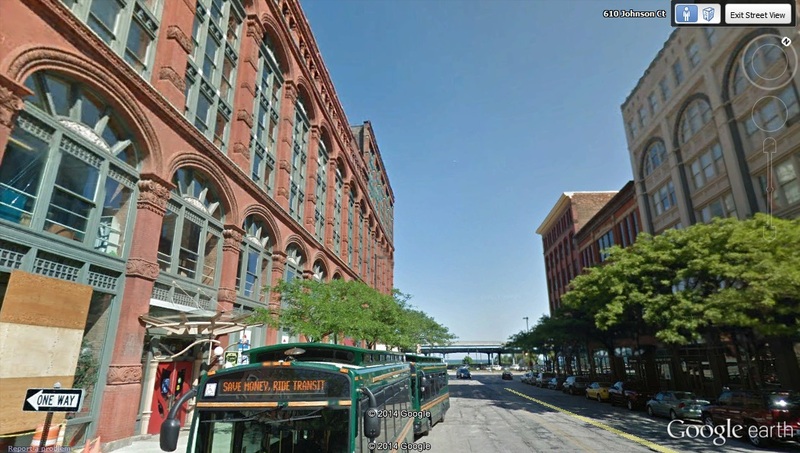 Notes and Observations: Like New Orleans, Milwaukee is an exception in that the year it experienced its peak population was 1960 opposed to the more common 1950 seen for many American municipalities. 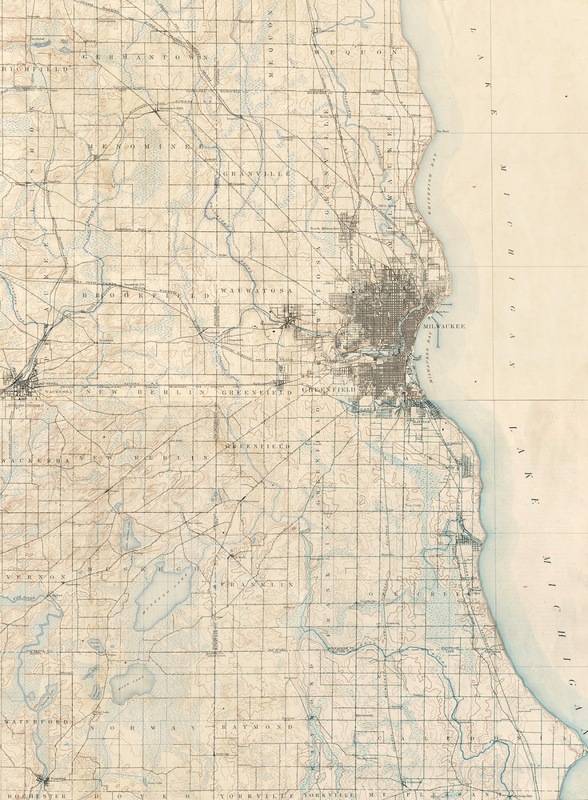 A topographic map of Milwaukee and vicinity stitched together from sheets dating from 1899 . Corner of Michigan and Broadway in Milwaukee, Wisconsin. 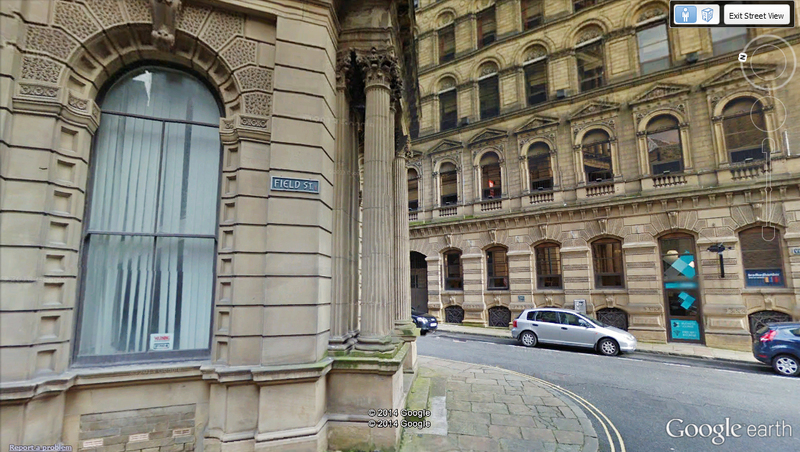 To the left is the grain exchange, built 1880. In the middle and in the background is the Mitchell Building, built 1876. To the right is the Loyalty Building, built 1886. Explore of Google Street View. Notes and Observations: Bradford is a little overshadowed by its neighbour Leeds but it certainly has a lot to offer architecturally. The centre starts its trend of losing population only by the 1960's which is a little later than usual. The overall average date for the centres in this article being 1950 and for the British Isles; 1940. A map of Bradford (large centre on the left), Leeds (large centre on the right, also analyzed in this article), and vicinity. 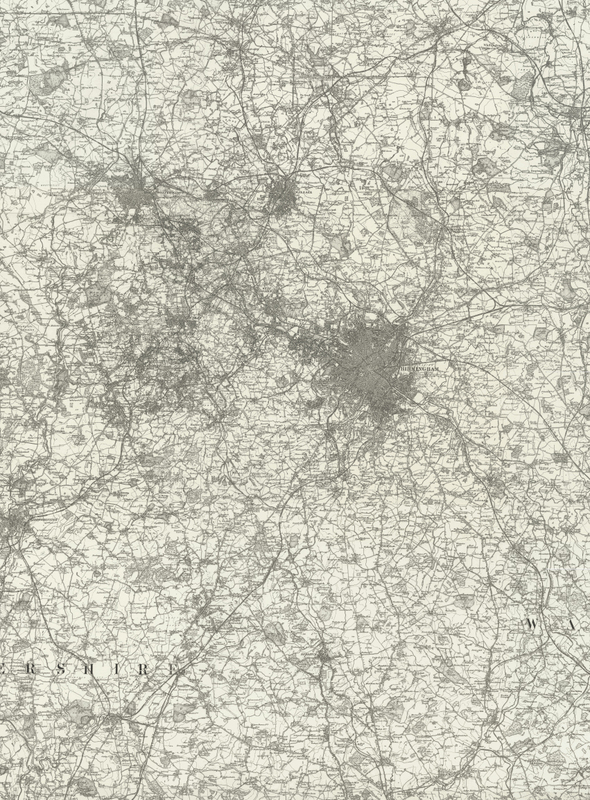 Sheets from an early ordnance survey of Britain, 1885-1900 . 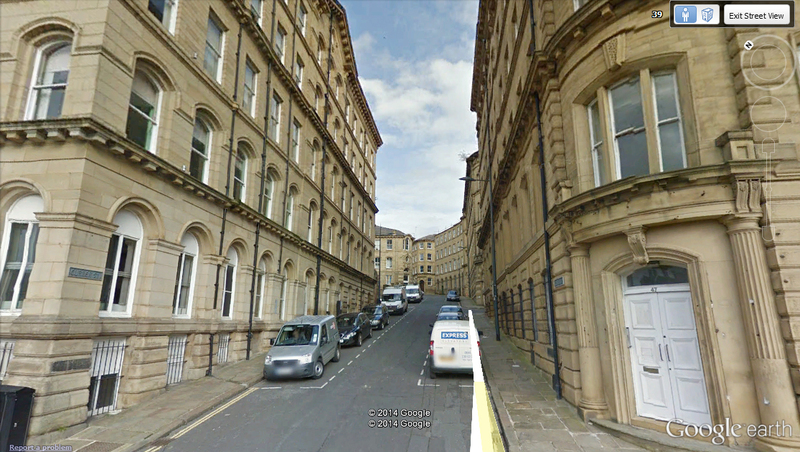 The Victorian merchant warehouses of Little Germany, Bradford, United Kingdom. Explore on Google Street View. Notes and Observations: The city was founded in response to political issues experienced by the current federal capital of the newly formed republic, Philadelphia. The idea of creating the District of Columbia was to have a capital that was independent of the state for its own security. Since then, other countries like Australia and Brazil have created similar capital districts and cities. Its population trend expresses some stability beginning at the 1980 census onward and most recently beginning to increase in population. 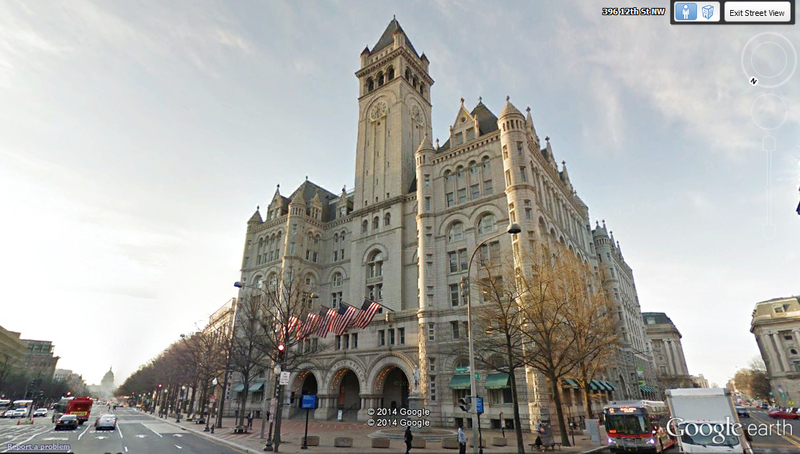 Similar in style to the municipal buildings featured earlier in this article is Washington, D.C.'s old post office. Built 1892-1899. Explore on Google Street View. Notes and Observations: Both Montreal and Toronto differ from the trends of the American of the American municipalities in that they both have a peak in population in 1971 opposed to the more common 1950 for the American counterparts. They also amalgamate the areas around them around the turn of the twenty-first century causing an immense spike in population. It's interesting how well ingrained Toronto is in people's minds as the most populated city of Canada when Montreal had this title for so many years prior. Victorian Warehouses in Vieux-Montréal. Explore on Google Street View. Notes and Observations: West Ham was a county borough immediately east of London that was eventually united with East Ham to form the London borough of Newham. At the peak of its population it was a working class area. A map of London, England and vicinity including the county borough of West Ham which is located to the upper right of Inner London (River Lea forms a visual distinction between the two. Sheets from an early ordnance survey of Britain, 1885-1900 . The Grove in Stratford, West Ham. Explore on Google Street View. Notes and Observations: Like Philadelphia, Boston, St. Louis, and Cleveland, Newark also experiences a brief decline in population during the 1930's. Its population trend is fairly gentle for an American municipality. A topographic map of New York City and vicinity (Newark is the built up area on the left halfway between the top and bottom) stitched together from sheets dating from 1889-1897 . To the right is St. Michael's Medical Centre and to the left are terraced houses in Newark. Explore on Google Street View. Notes and Observations: Hull's population trend during the twentieth century has been surprisingly uniform. A map of Kingston-upon-Hull, England and vicinity. 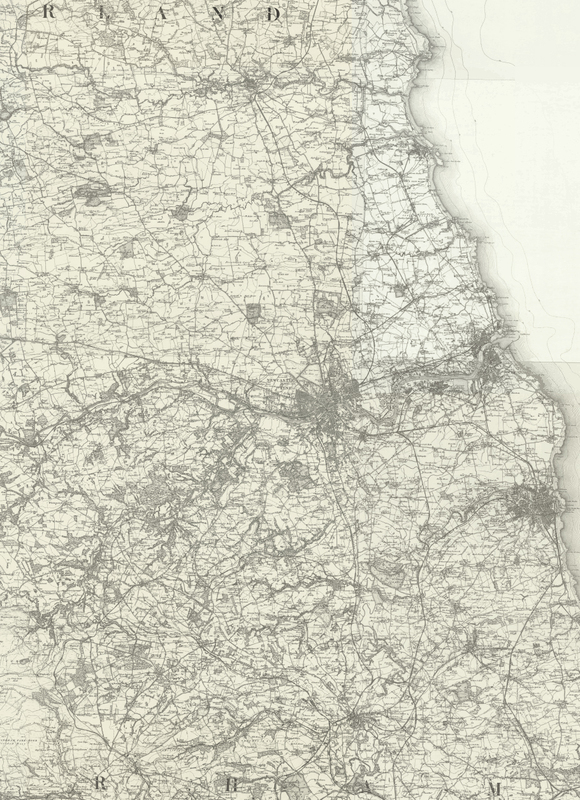 Sheets from an early ordnance survey of Britain, 1885-1900 . 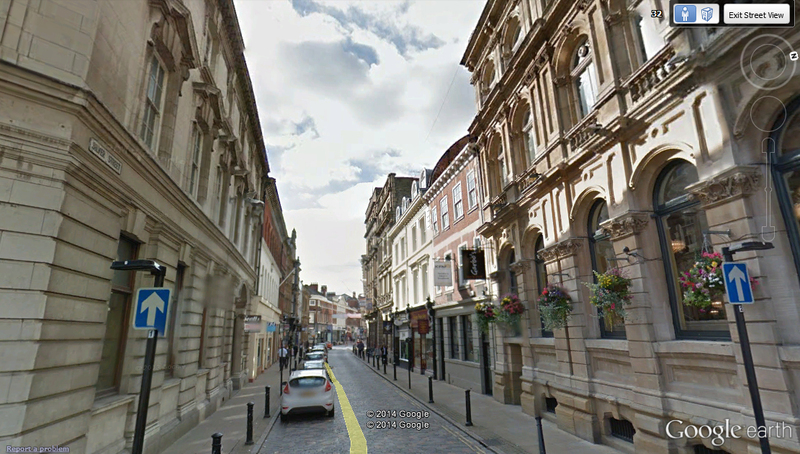 Kingston-upon-Hull. 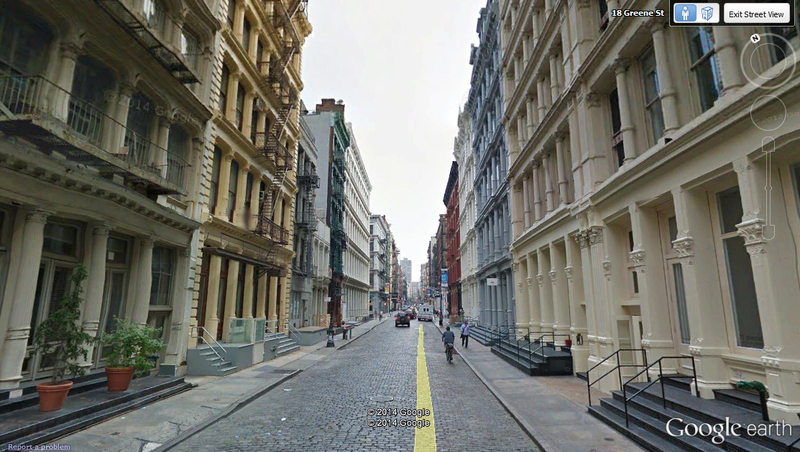 Explore on Google Street View. Notes and Observations: Nottingham's population trend has been fairly consistent throughout the twentieth century. A map of Nottingham (upper right), Leicester (lower right, also analyzed in this article), Derby (upper left, not analyzed in this article, would have ranked at #73), and vicinity. Sheets from an early ordnance survey of Britain, 1885-1900 . 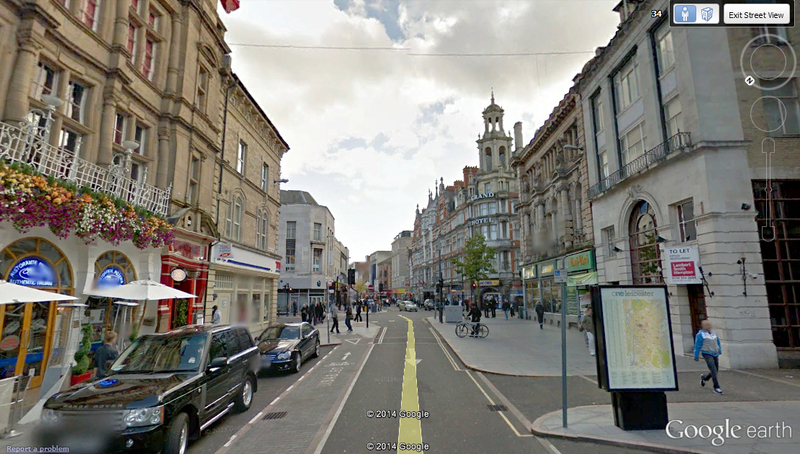 Nottingham. Explore on Google Street View. Notes and Observations: Salford is situated in a meander of the River Irwell within the metropolitan borough of Greater Manchester. Out of all of the municipalities listed in this article, Salford experiences one of the most noticeable drops in relative population going from a peak of 234,045 to a low of 72,750. My hypothesis is that due to its proximity to the more significant municipality of Manchester and the fact that Salford was a highly industrialized centre with a large working class population, deindustrialization has impacted it more severely than average. It is likely that other services and industries would be more likely to experience a renaissance in Manchester proper while Salford is more likely to be seen as a component of the greater whole that is the Greater Manchester area. Much of Salford is redeveloped with many parts having been identified as "Victorian slums" and subsequently demolished and replaced by tower blocks and other types of modern housing. It is because of this that impressive examples of Victorian architecture are difficult to come by in the city. A map of Manchester, England and vicinity. Salford is located within the morphological urban area of Manchester and comprises a good bit of the western part. 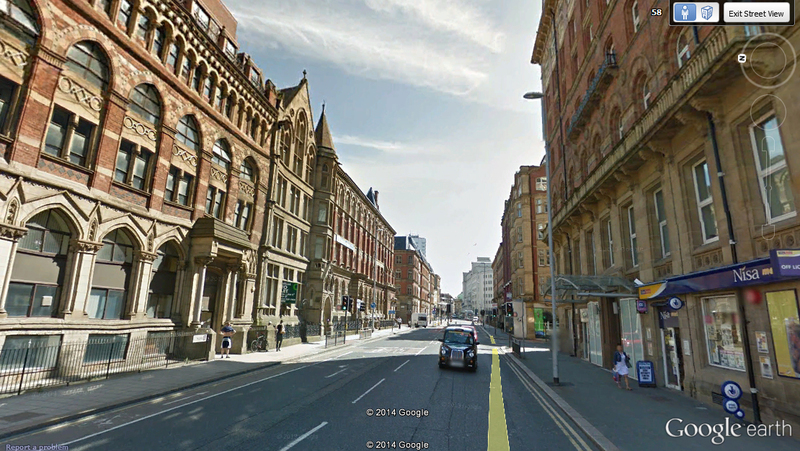 The two are separated by the River Irwell. Sheets from an early ordnance survey of Britain, 1885-1900 . 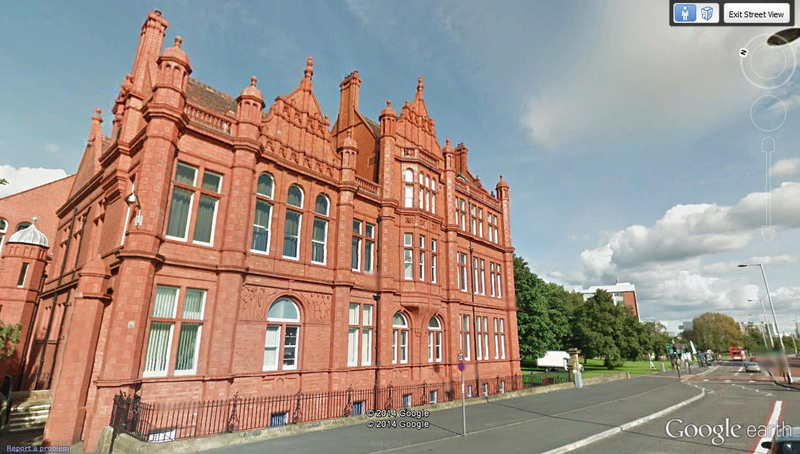 Peel Building, University of Salford, England. Built 1896. Not too much Victorian architecture is still present in central Salford although there still are some working class terraces. Explore on Google Street View. 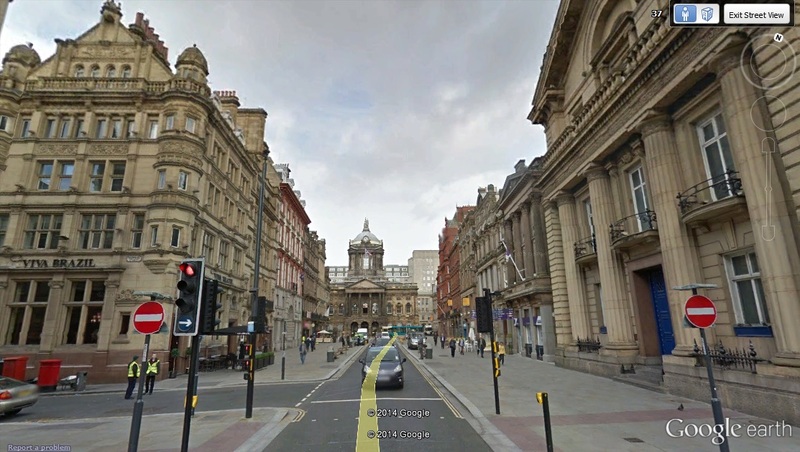 Notes and Observations: Despite Newcastle having had some fluctuations in population during the twentieth century, the city has maintained a fair amount of pre-1900 architecture in its city centre. A map of Newcastle-upon-Tyne, England and vicinity. Sheets from an early ordnance survey of Britain, 1885-1900 . Grainger Town, built 1824-1841, in stone. These buildings are considered some of the finest in the entire city. They were built during a transitional period between what defines the Georgian and Victorian styles. 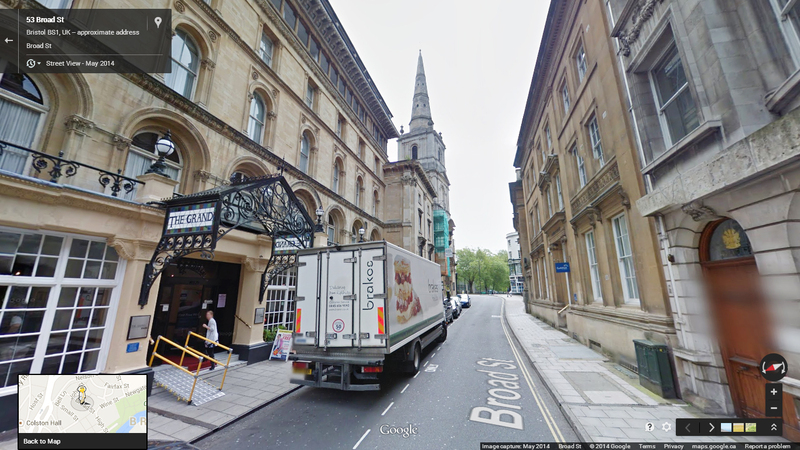 The porticoed building to the right is the Theatre Royal, built in 1837. Explore on Google Street View. Notes and Observations: Leicester's population during the twentieth century has been surprisingly stable relative to the other municipalities analyzed in this article. A map of Nottingham (upper right, also analyzed in this article), Leicester (lower right), Derby (upper left, not analyzed in this article, would have ranked at #73), and vicinity. 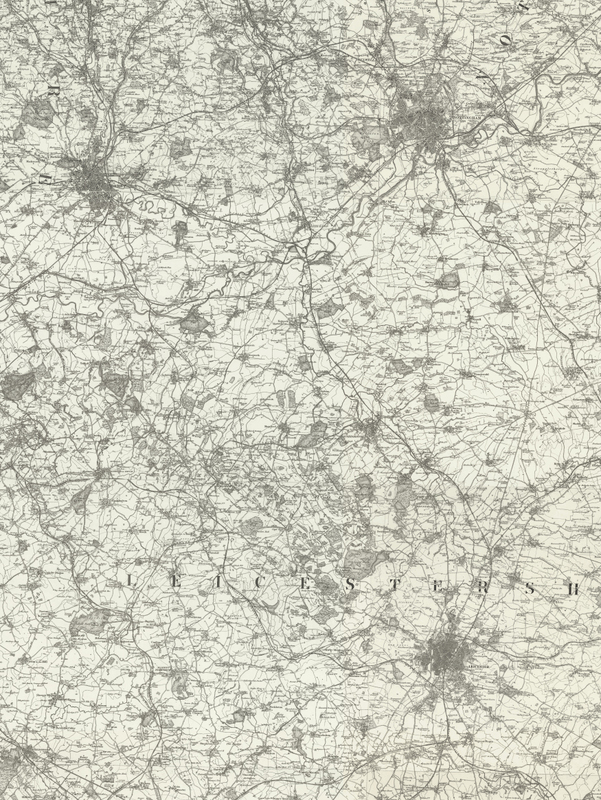 Sheets from an early ordnance survey of Britain, 1885-1900 . The Grand Hotel, the towered building on the right down the street, was built 1897-1898. Explore on Google Street View. Notes and Observations: Both Montreal and Toronto differ from the trends of the American of the American municipalities in that they both have a peak in population in 1970 opposed to the more common 1950 for the American counterparts. They also amalgamate the areas around them around the turn of the twenty-first century causing an immense spike in population. In Toronto's case, its population gain during the 1990's is the second greatest gain made during a decade of any municipality in this article (NYC's gain in the 1890's during which it amalgamated with Brooklyn was greater). 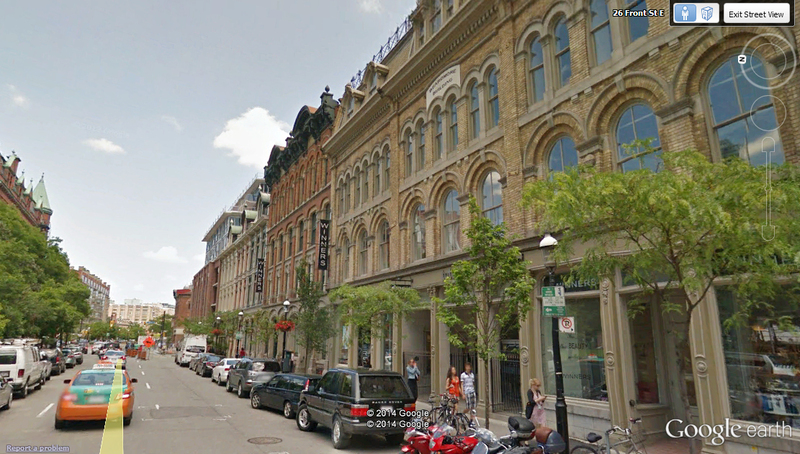 To the right is the Beardmore Building, built 1872. Further down the street is a section of building with multiple dormers visible, this is the Griffiths Building which was built 1872-1873 and is one of the few remaining examples of cast-iron fronted Victorian architecture in Canada. Across the street to the left is the Gooderham Building, built 1891, takes up a wedge-shaped lot and in doing so is often referred to as a "Flatiron-type" of building. Explore on Google Street View. Notes and Observations: Interestingly, like Philadelphia, St. Louis, Boston, Cleveland, and Newark, Jersey City also experienced a decline in population during the 1930's. What's different is that it didn't experience a comeback in population during the 1940's like the aforementioned municipalities and instead continued to decrease in population. 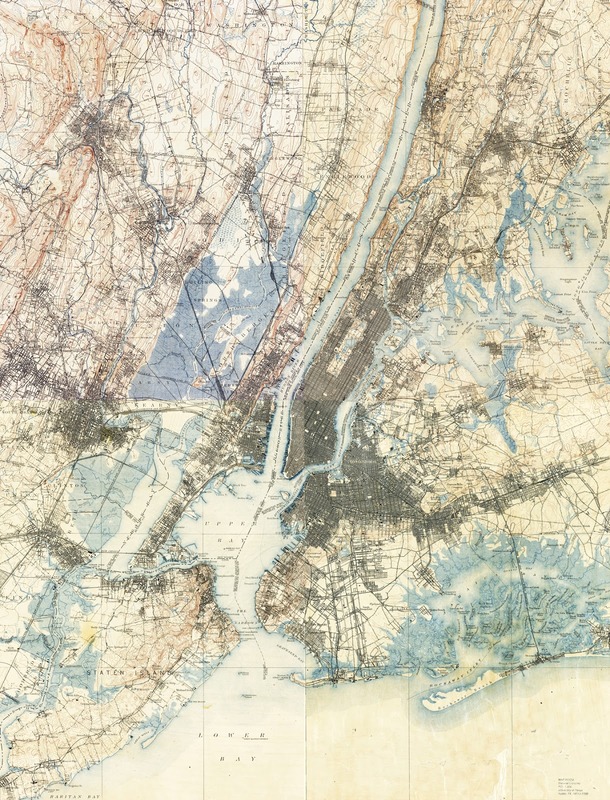 A topographic map of New York City and vicinity (Jersey City is on the west side of the Hudson River from lower Manhattan) stitched together from sheets dating from 1889-1897 . Victorian commercial buildings in downtown Jersey City. The city is better explored through its impressive stock of Victorian brick and stone residential architecture. Explore on Google Street View. Notes and Observations: Like New Orleans and Milwaukee, Louisville is an exception for American municipalities in that it didn't begin to decline in population until the 1960's opposed to more commonly the 1950's for other American centres. 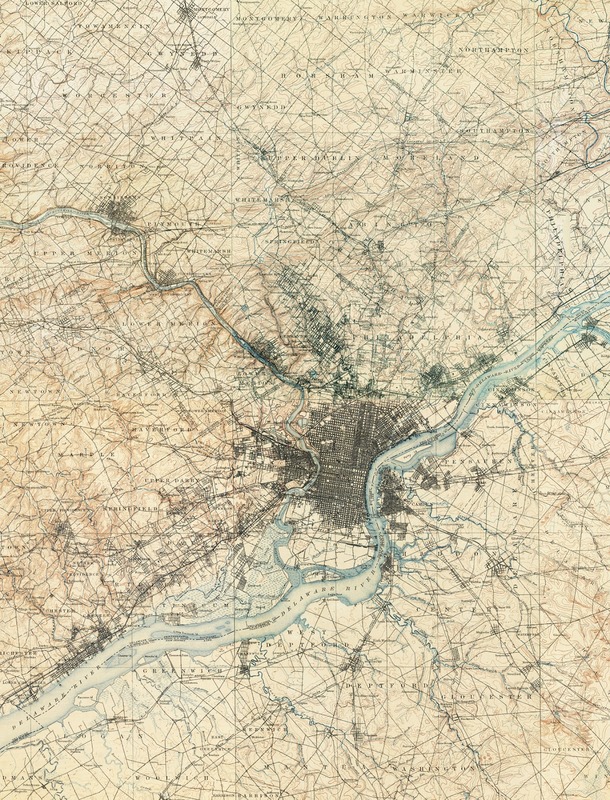 A topographic map of Louisville and vicinity stitched together from sheets dating from 1905-1910 . The historic Victorian commercial core of the city features a number of Façades finished in different materials: cast-iron, stone, and brick. Explore on Google Street View. Notes and Observations: Quebec City's growth has been noticeably stagnant until 2011 where it amalgamated the surrounding metropolitan area subsequently increasing its population in an unprecedented quantity not observed before in its data. One of the main reasons why I wanted to included Quebec City in this article for reference is because of how many people tend to regard it as the most "European" or "historic" city (its a walled city on top of a cliff overlooking the mouth of the St. Lawrence River) in North America or north of Mexico. It causes me to question how reliable particular metrics of measurement are on their own in determining whether or not a municipality will contain many examples of Georgian or Victorian architecture. Quebec City is relatively old for North America, it had a sizable population relative to other municipalities in the DESW in North America during the eighteenth and early nineteenth centuries. 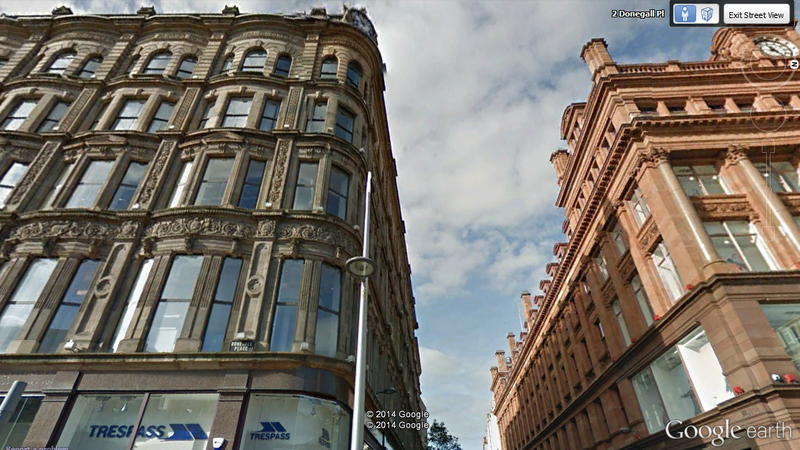 It was also lucky in that it didn't end up being redeveloped too much during the modern declining period. 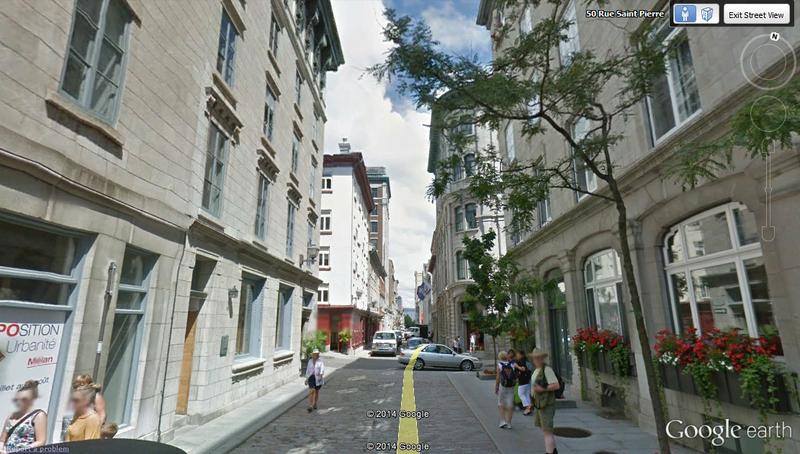 Rue Saint-Pierre in Quebec City was considered to be the "Wall Street" of Canada (Rue Saint-Jacques in Montreal also held the title) around the turn of the twentieth century due to its high concentration of banks. Explore on Google Street View. Below is a chart comparing the populations of each municipality analyzed in this article relative to London's population. Quebec City's population is also included. The table below shows the which year a municipality peaked in populated before subsequently declining. The small decreases before the onset of steady decline are not taken into consideration. Philadelphia, St. Louis, Boston, Cleveland, and Newark all experienced a brief decline in the 1930's likely as a result of the Great Depression. Jersey City's onset of decrease begun in the 1930's and didn't make a comeback in the 1940's like the aforementioned municipalities. The average onset year for all of the municipalities that have experienced a decrease trend in population is 1950/1951 (mathematically 1948.868421, but rounded to an actual census date here). For Canada it is 1971, for the British Isles it is 1940. Overall, it would appear important to look at as many factors as possible in order to accurately predict where it is likely that Georgian and Victorian architecture and other artifacts might be found. Humans being present is obviously a necessary condition but it is obviously not in of itself sufficient (e.g. Detroit having many people but subsequent decay). Even if buildings and artifacts are still present there are a number of other factors that influence them. How long it has been continuously inhabited. This likely contributes to why older municipalities on the east coast of North America and those among the British Isles tend to have more substantial collections of Georgian, Victorian, and in the case of Britain, even older architecture. Examples: Boston, New York City, Montreal, Quebec City, Edinburgh, Leeds, Newcastle-upon-Tyne, and Bristol. It didn't go through a "boom and bust" cycle. municipalities that exhibited a more consistent and gradual increase in population and avoided dramatic losses in population tend to have more intact historic inner urban landscapes. Examples: San Francisco, Washington, Toronto, Melbourne, and Sydney. It's interesting to think about how San Francisco and Melbourne are mining boom towns in some sense, but they didn't experience a "bust" and reestablished their economies in other things. In some sense, you could look at Detroit as a boom town with its "boom" occurring over an extended amount of time (i.e., not a simple two year boom most commonly thought of when thinking of a "boom town"). A bourgeoisie was present opposed to only a working class. In cases where the wealthy owners of production live far away (i.e. most commonly London) and invest money into an underdeveloped region (e.g. Uganda) there isn't much gain for the people in the underdeveloped region compared to that of the region that controls it. It didn't experience disasters. e.g Volcano, fire, war, firestorm, etc. For example, due to the 1906 San Francisco earthquake and subsequent fire, there are very few examples of Victorian architecture remaining within the centre of San Francisco although many examples still exist in the city's Victorian suburbs. It didn't undergo dramatic urban renewal projects. During the 1960's many Victorian areas that were considered "slums" were razed and modern tower blocks and housing estates were built to replace them. They're still not a favourable place to live. Also, during the second half of the twentieth century may of the central areas of the British municipalities were redeveloped with modern shopping centres. It possessed prominent institutions and subsequent prestige drawing in more wealth. For instance, being designated as a capital of a region would automatically raise the image of a municipality in people's minds. It would attract more companies and politicians. The municipality was not part of the greater conurbation of another municipality. For example Salford and West Ham have experienced substantial decline and since they can be easily thought of as components of the more significant municipalities they are near (West Ham was actually absorbed by Greater London) they may not experience rejuvenation. In this section is an interactive map of all forty-one municipalities analyzed in this article. Each centre is denoted by a red circle with Quebec City being differentiated by a yellow circle. When you click on an icon it will display a box with extra information which includes: the municipality's population in the year 1900/1901 and its rank among municipalities in the world for that year. 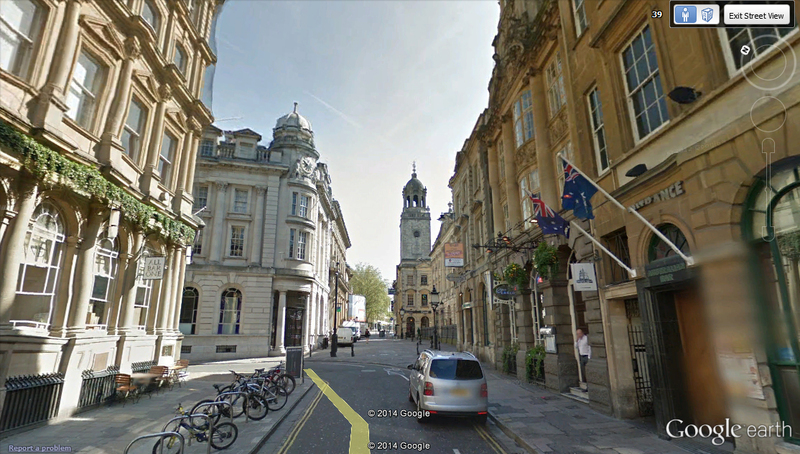 Here's a link to a version of the map where Google Street View is enabled: Map. The overlay on this version is a bit unstable meaning that you may have to reload the page now and then. Directly below, there's a full screen option on the upper right corner of the embedded map interface. The full screen version has a search bar that you can use to search for any of the municipalities. For links to all of my related writings you can visit my Population Data and Architecture Articles page. Incorporated: Refers to a "municipal corporation" which is a political subdivision composed of citizens and a geographic area. In this article's case it may be a village, town, or city. Urban Designation: The official title of "unincorporated", "village", "town", or "city". Time Immemorial: Means that something occurred so long ago that no one can really remember or find any records regarding its occurrence. Eclectic: Derived from a broad and diverse range of sources. DESW: "Developed English Speaking World". A term that I came up with to describe the collective of the United States, United Kingdom, Ireland, Australia, New Zealand, and Canada. City Proper: Meaning contained within the officially recognized boundaries of a city. Rustication: A decorative type of masonry where the stone is cut in such a way that leaves the surface rough or projecting markedly. Conurbation: An urban region comprised of a number of other incorporated municipalities such as towns and cities that all share an interconnection and common identity among each other. To keep things neat and manageable, I utilize one universal reference list for all of my population and architecture related articles: Reference List for Population Data and Architecture Articles.